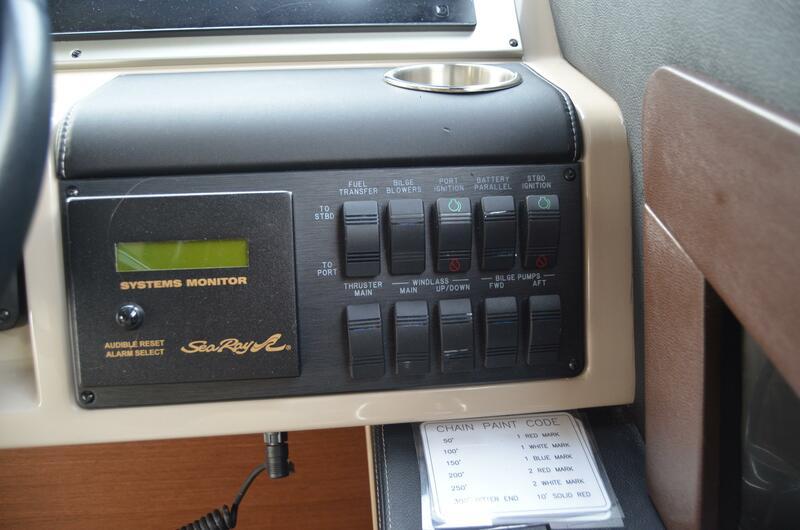 Canadian registered vessel. 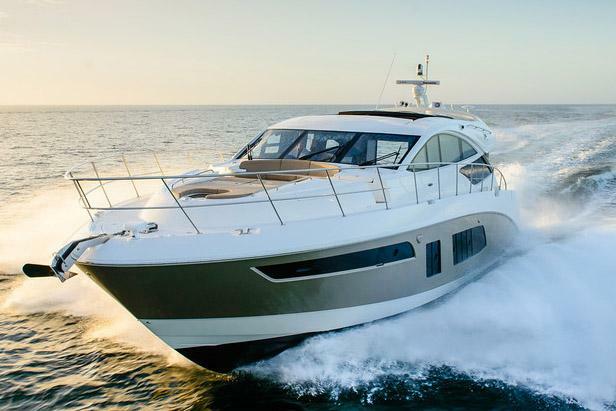 No tariffs or duty applicable to Canadian buyers!! 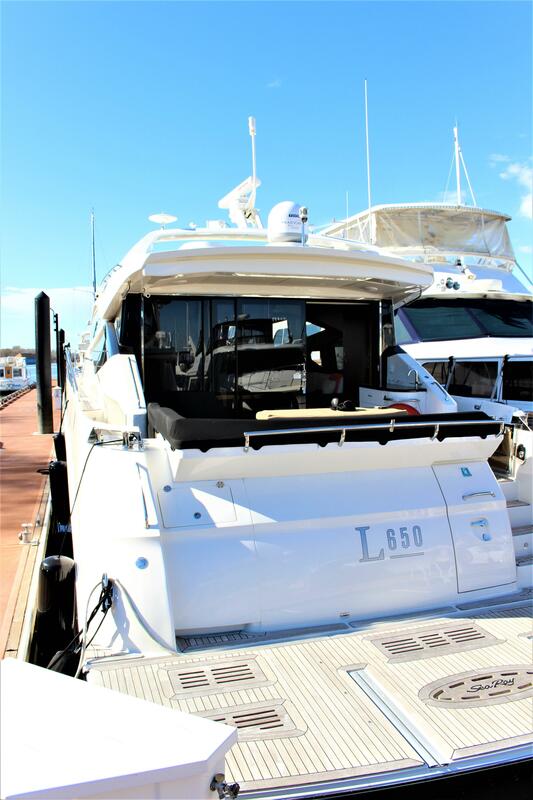 The L650 is about the combined experience of true luxury and true performance. That’s unmistakable precision, uncompromised command, and unbelievable power, all accompanied by the refined luxury of a world-class yacht. 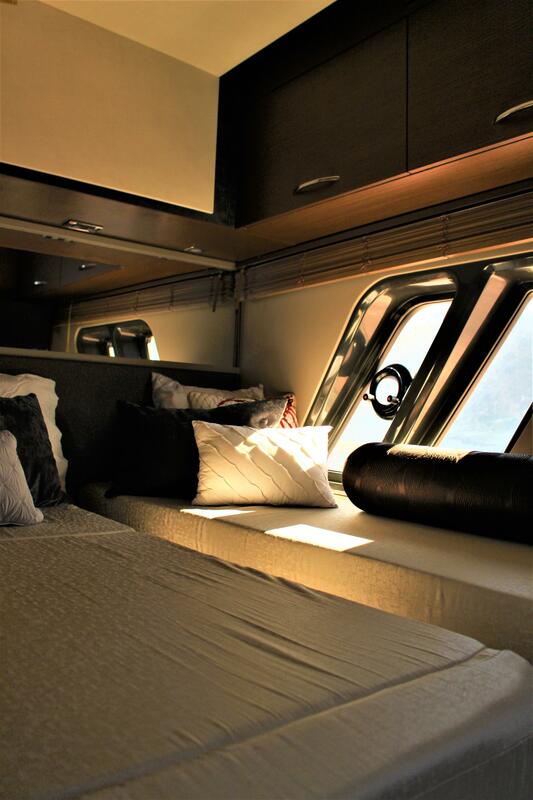 Truly awe-inspiring. 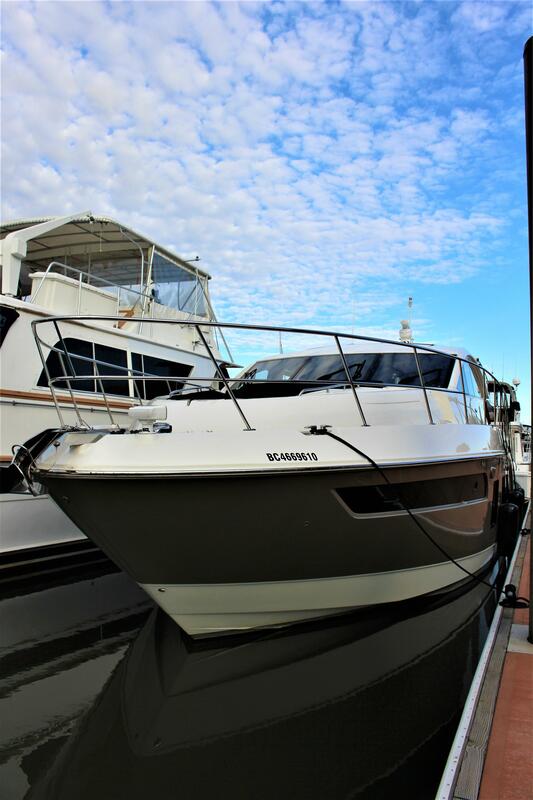 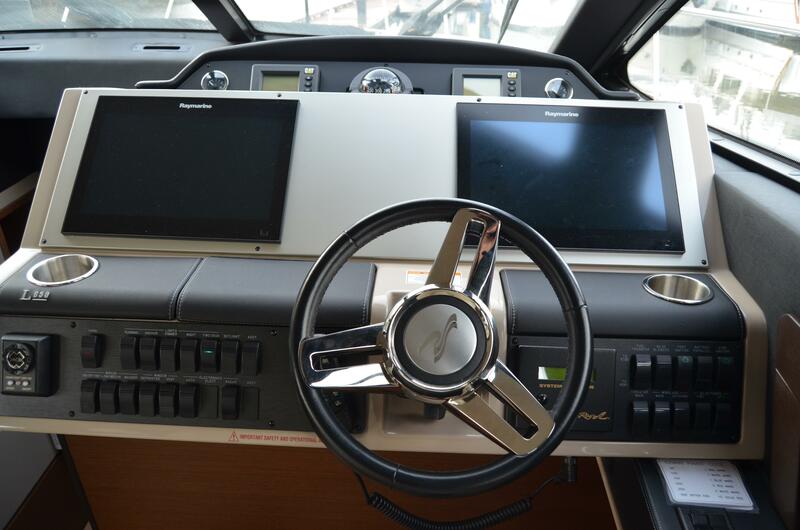 The L650 comes with a sophisticated propulsion system that comes with dual Raymarine® radar/GPS/chartplotters, autopilot, electric throttle & shift and standard bow & stern thruster control. 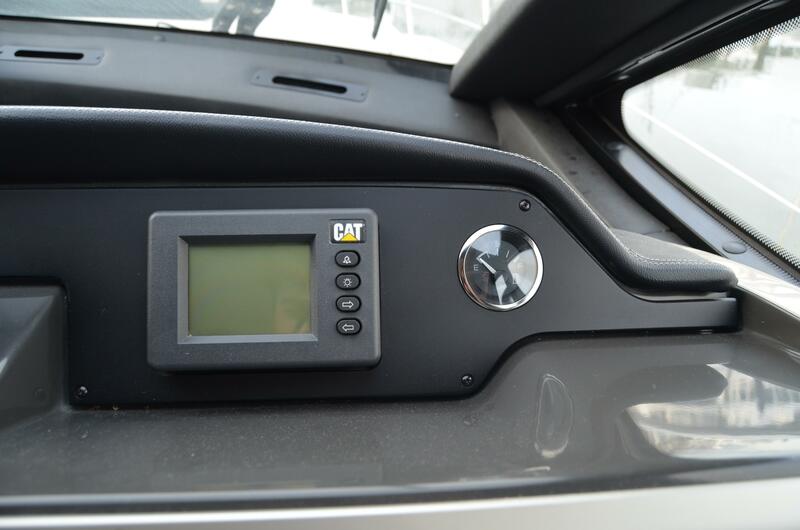 It’s on-the-nose accurate and allows boaters to feel confidently in control. 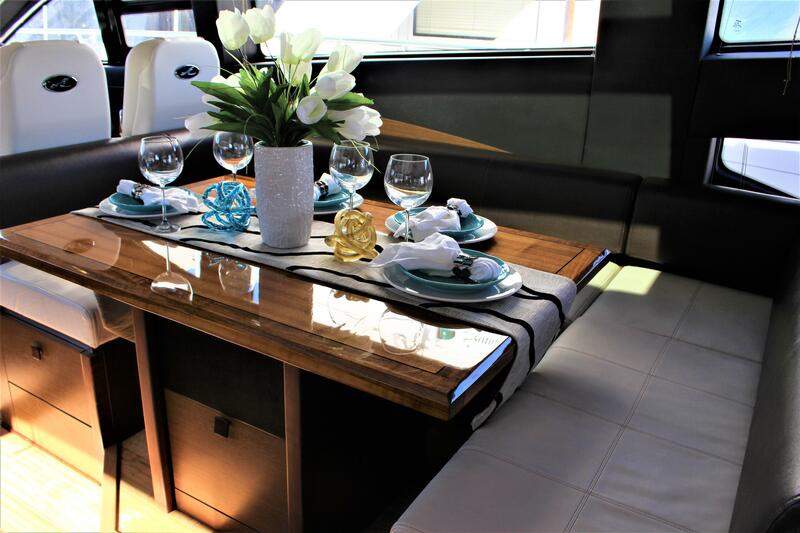 The L650’s standard twin 1,150-horsepower Caterpillar® powerplants deliver an exceptional cruising speed, so you can relax all day and make it to your destination in time for cocktails. 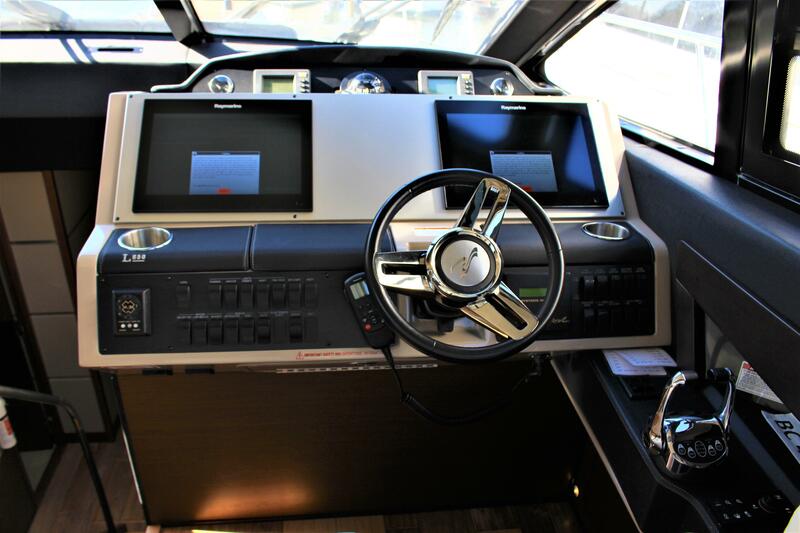 Even at slow speeds, this vessel moves with extra grace thanks to optional joystick-controlled bow and stern thrusters. 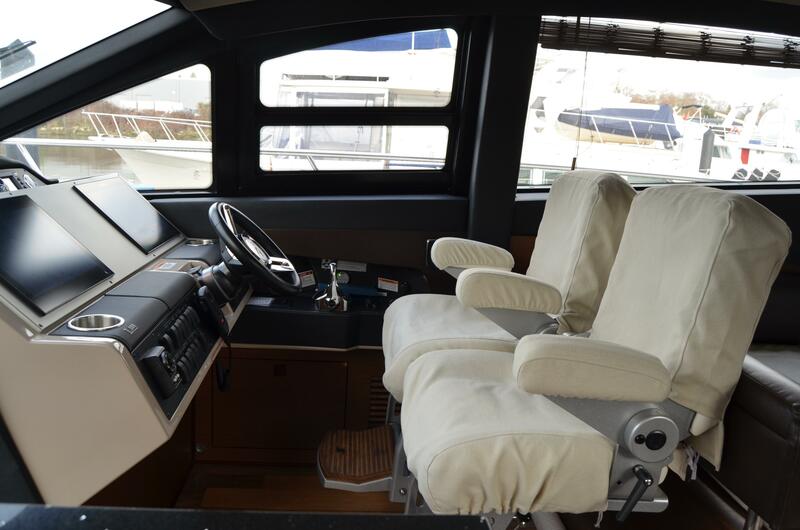 It’s a sophisticated cruising yacht that is easy to drive and effortless to enjoy. 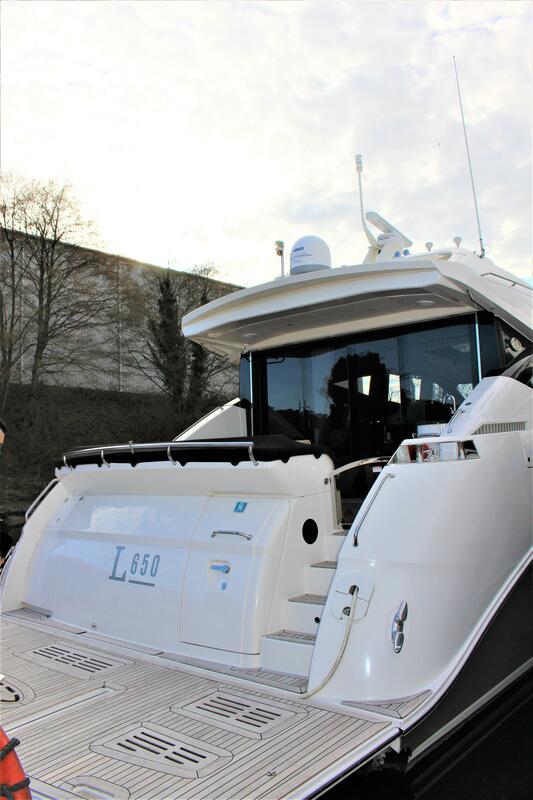 The L650’s standard twin CAT engines deliver exceptional cruising speeds, as you feel totally in control at the yacht’s exceptionally ergonomic helm. 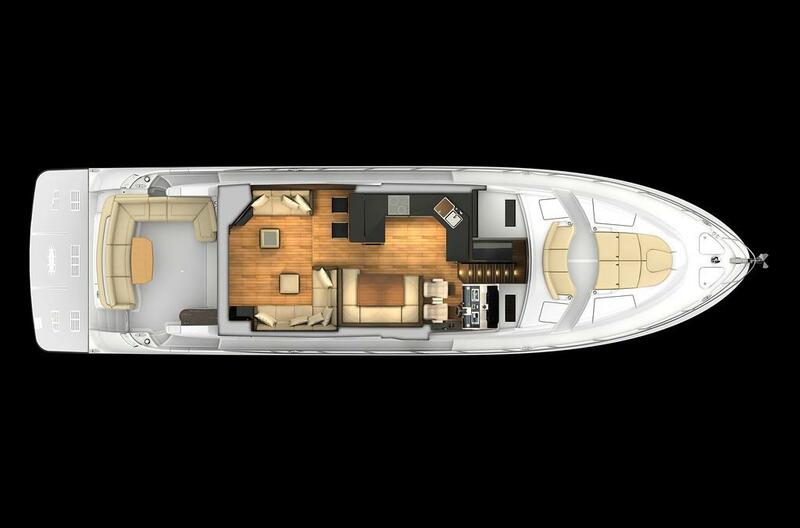 Even in crowded marinas and fairways you’ll move with style and grace thanks to optional joystick-controlled drives and thrusters. 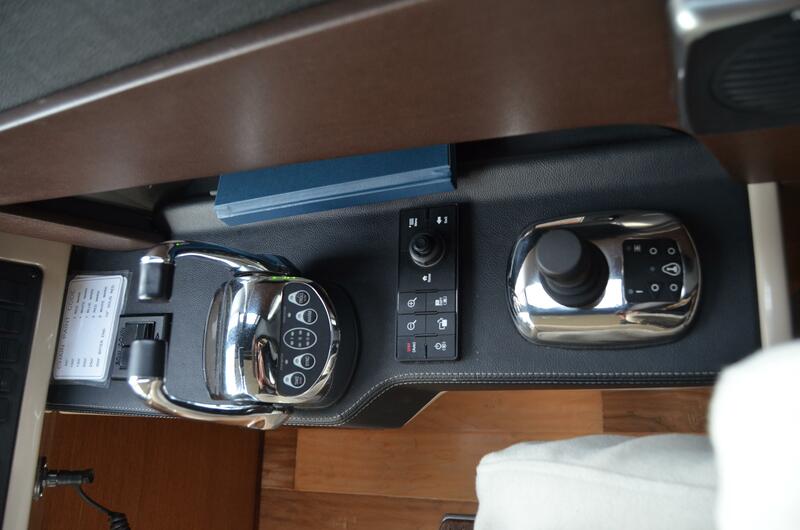 It’s a sophisticated powerhouse that’s easy to drive and effortless to enjoy. 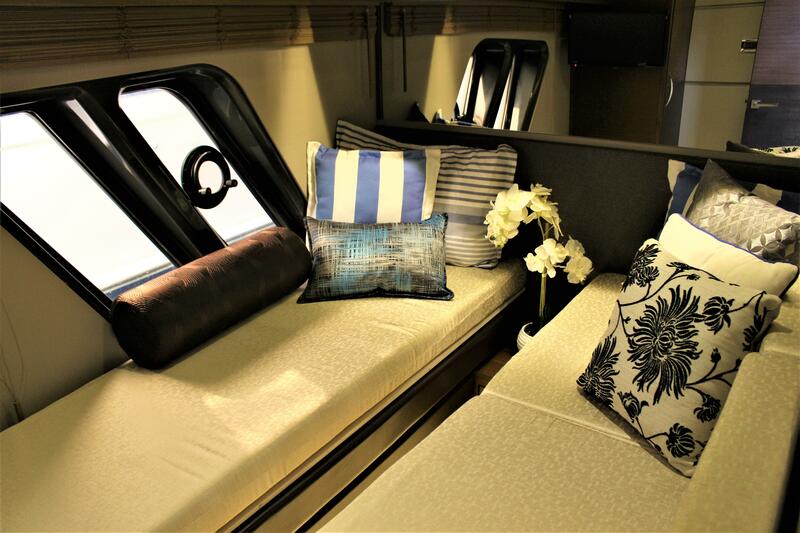 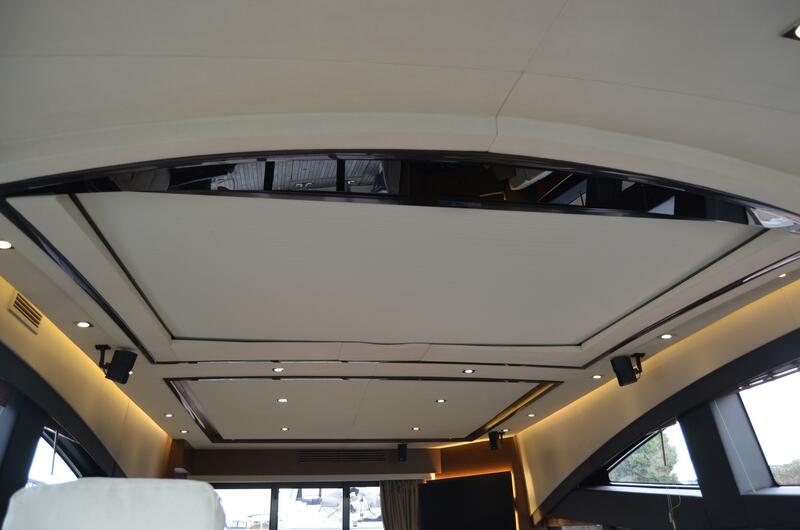 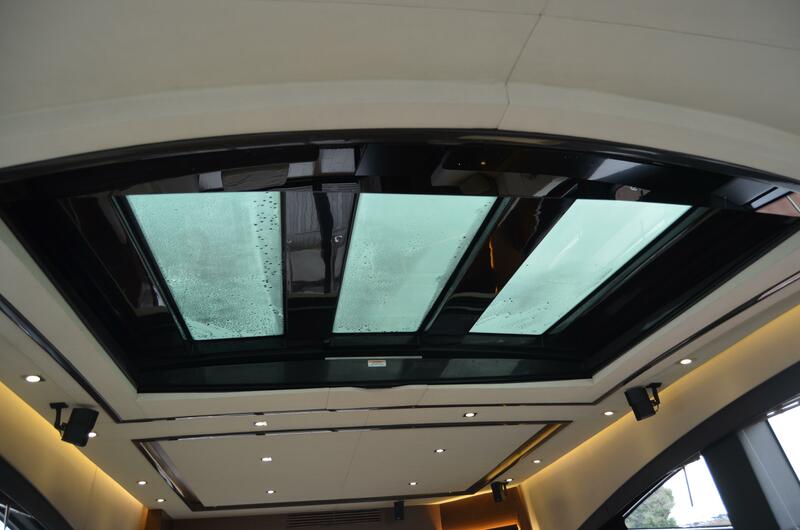 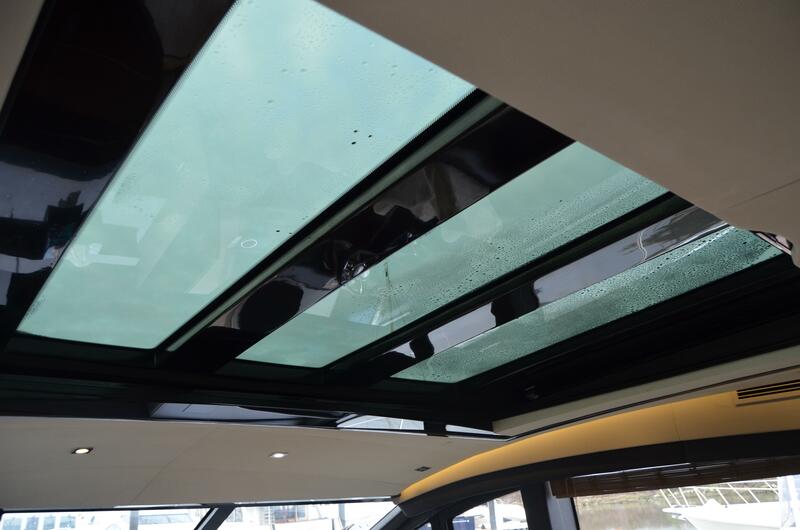 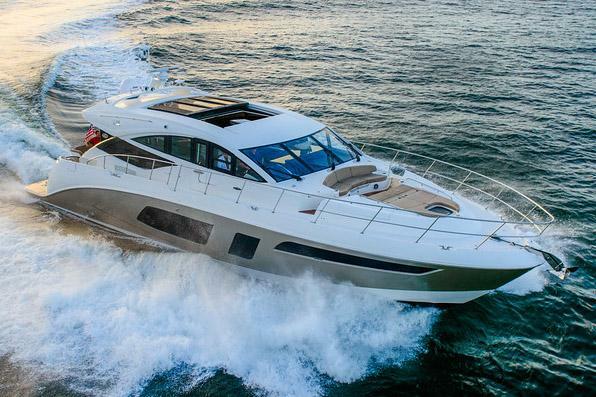 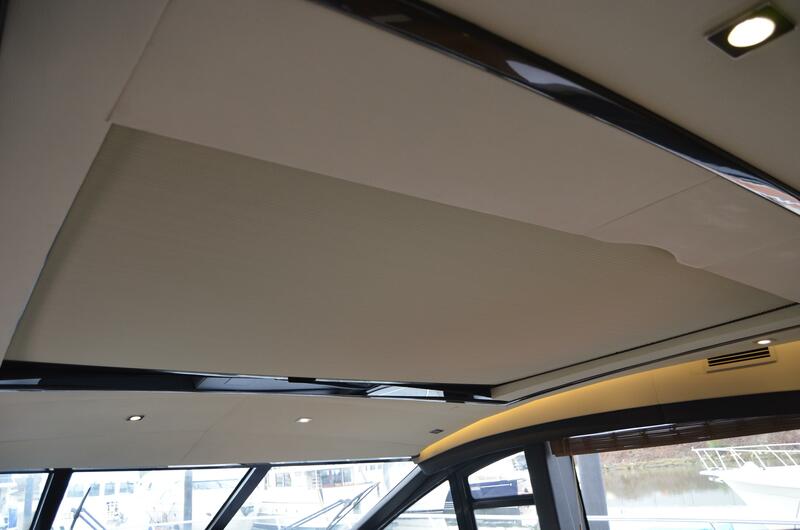 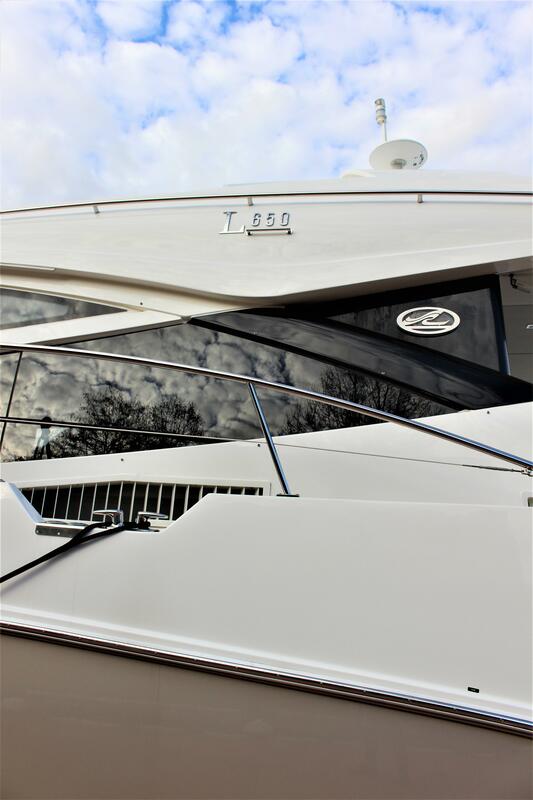 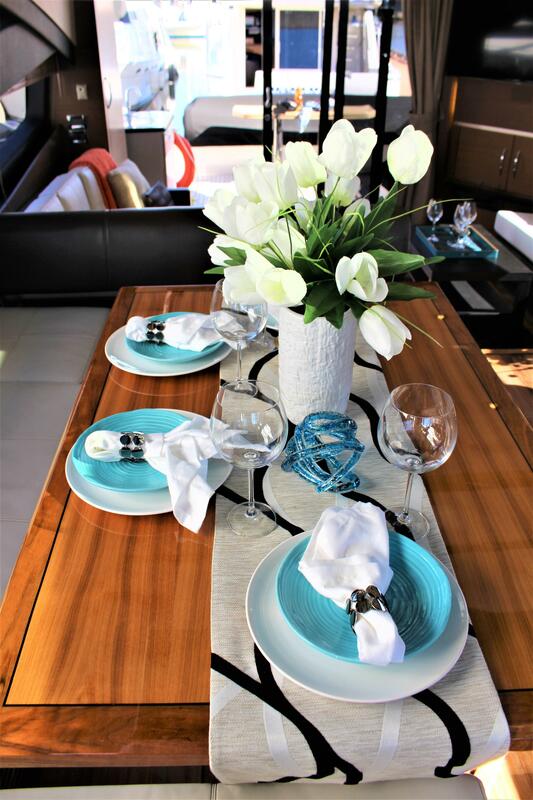 On the Sea Ray L650, the lazarette is fitted out as a small crew quarters. 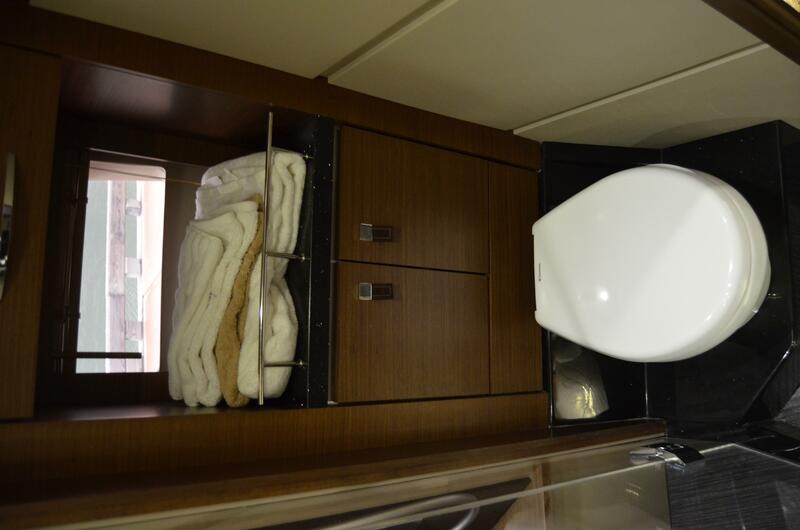 The space, while tight, is comfortable — two single bunks with a table, sink, faucet and a toilet. 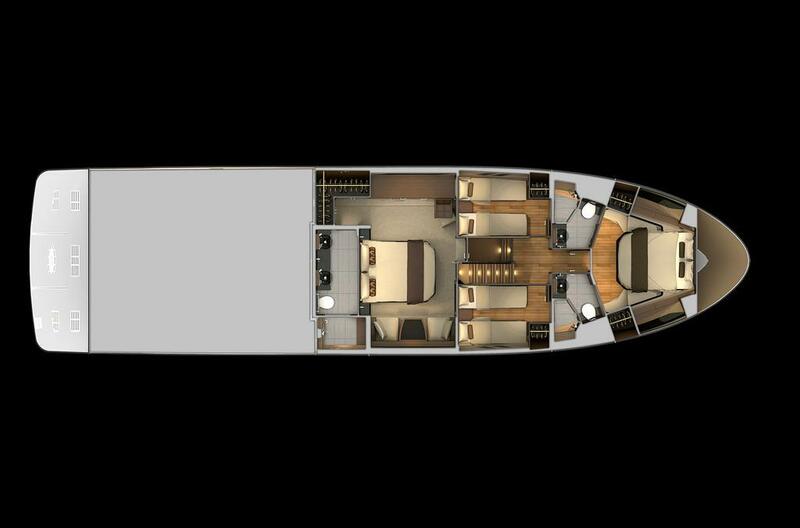 The head can double as the deck day head. 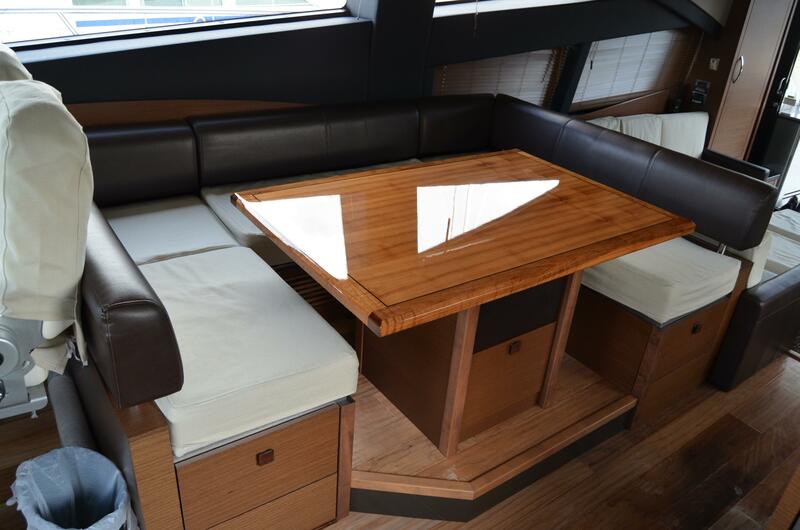 The cockpit itself is set up as a second salon, with a cushioned L-shaped couch and a teak tabletop. 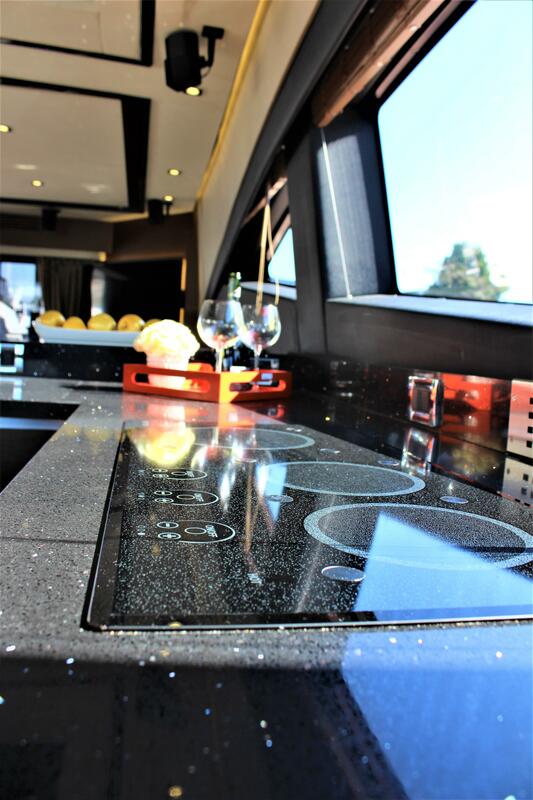 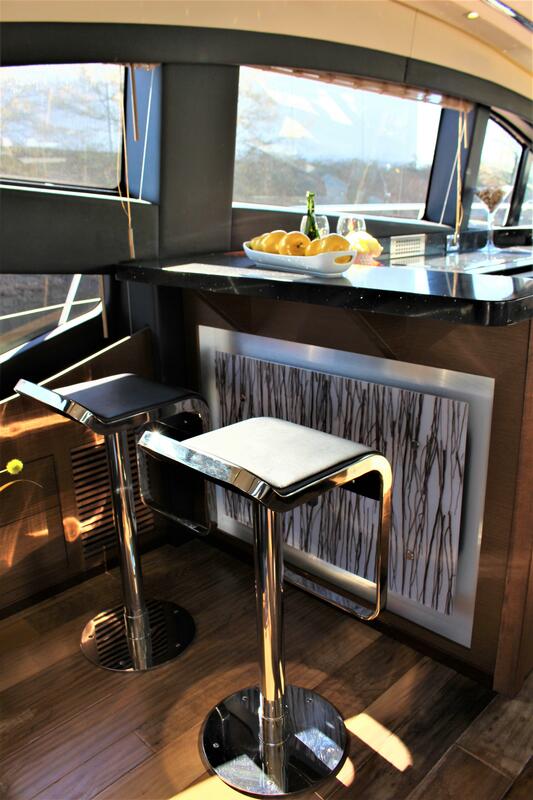 A fully equipped wet bar, refrigerator and grill make the cockpit suitable for entertaining. 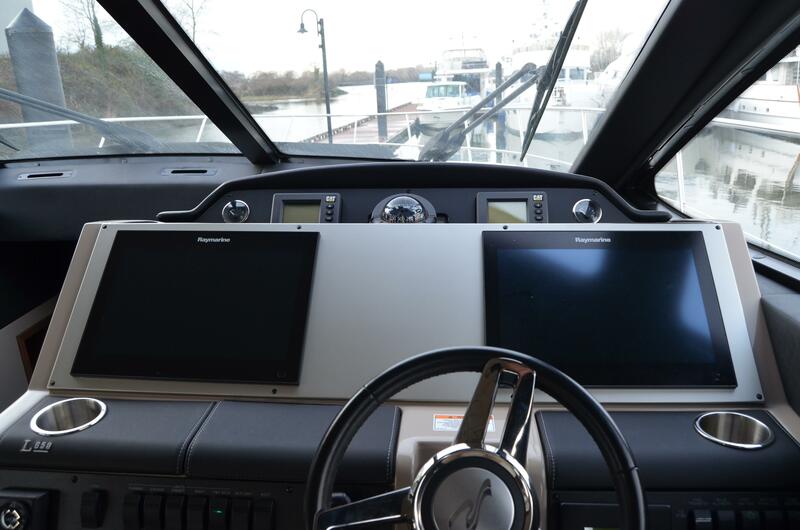 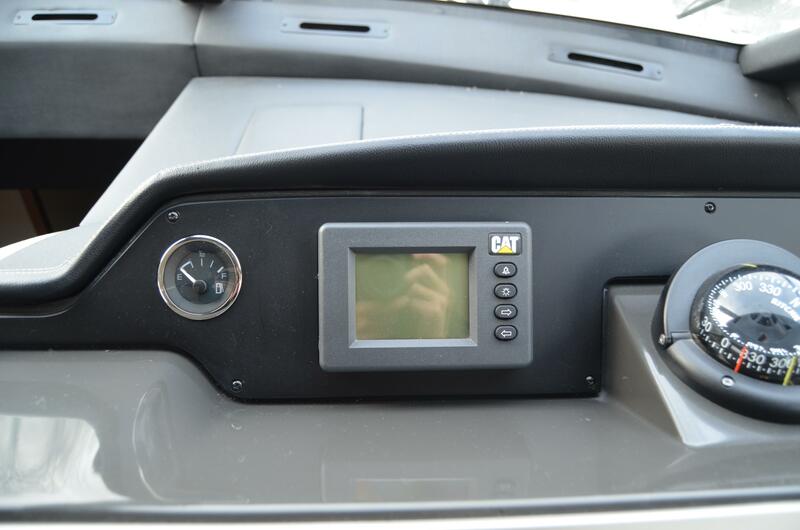 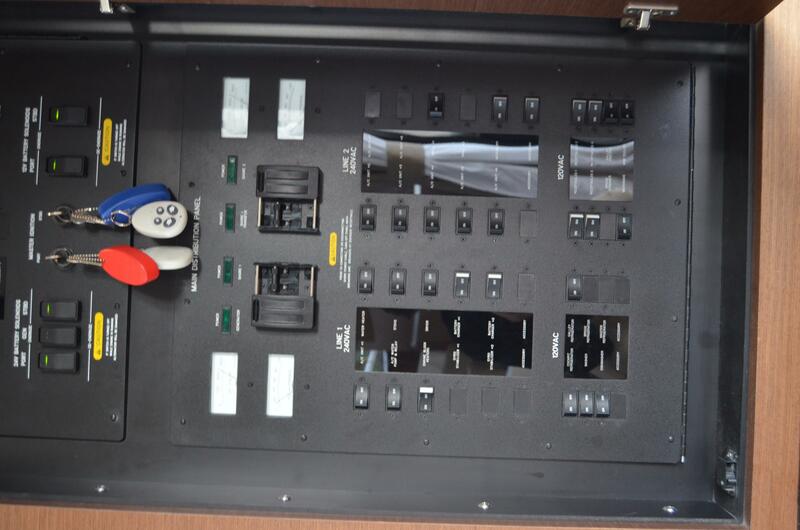 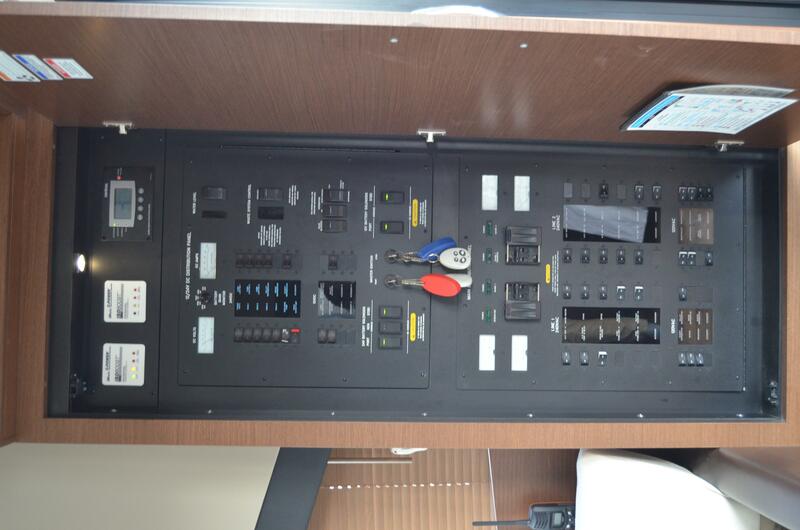 The vessel can be controlled from the cockpit by an optional docking station control on the starboard side. 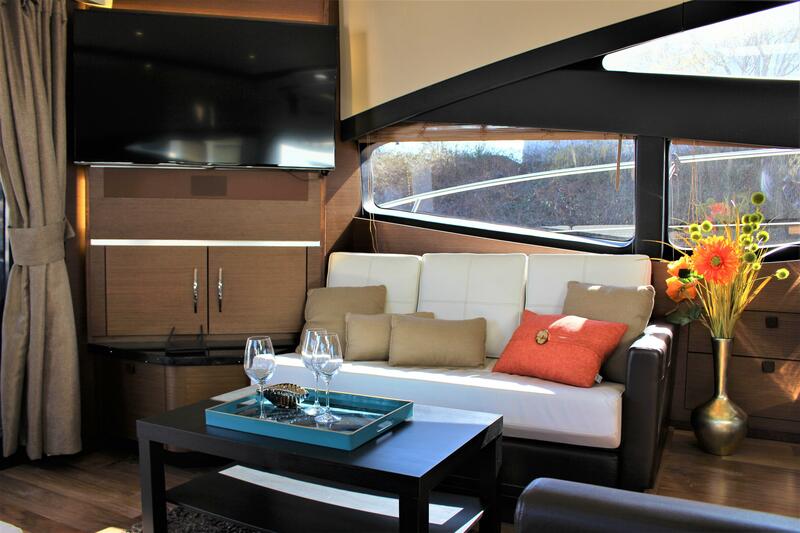 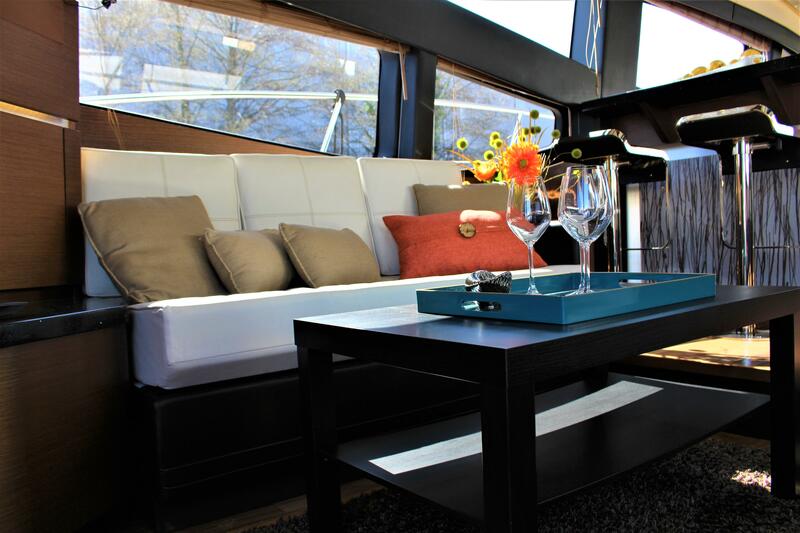 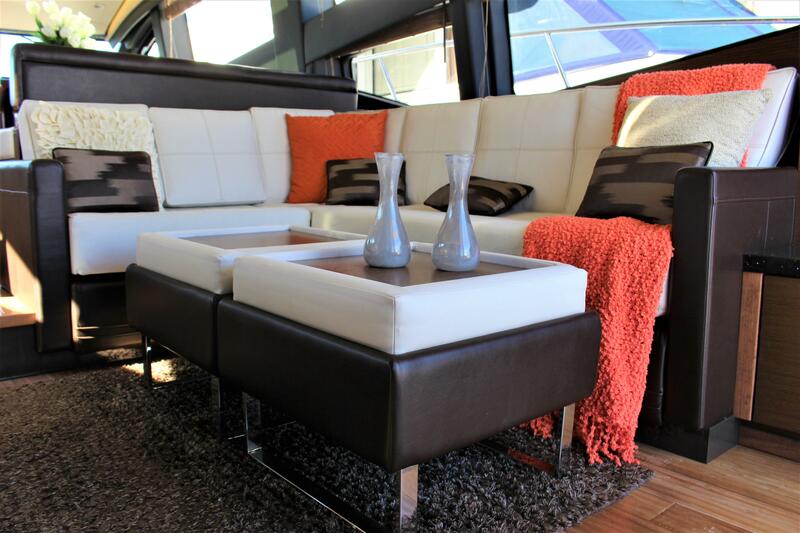 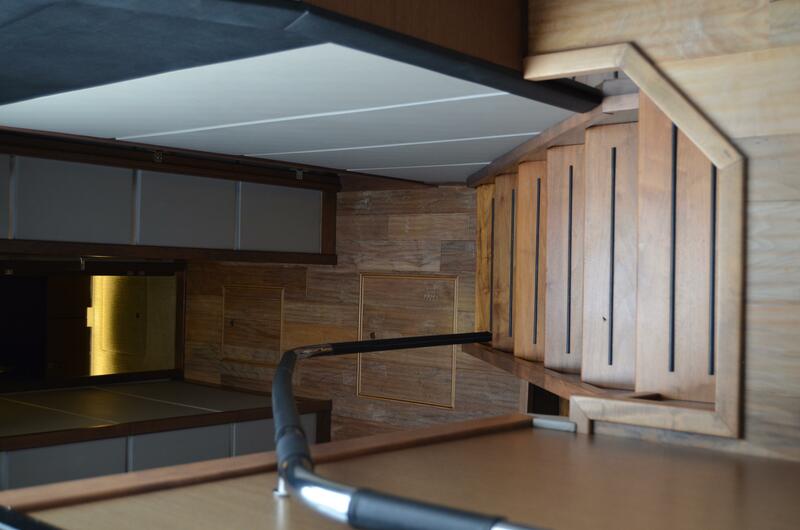 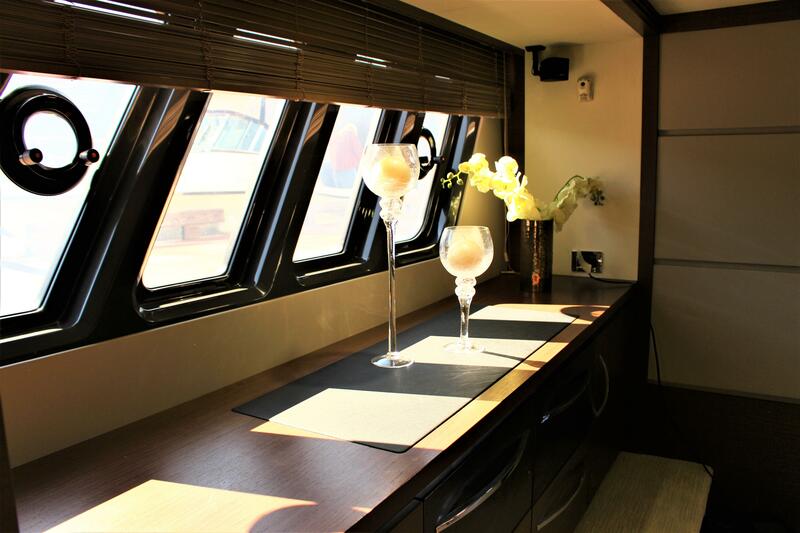 The foredeck is home to a lounge area, adding additional outdoor social space. 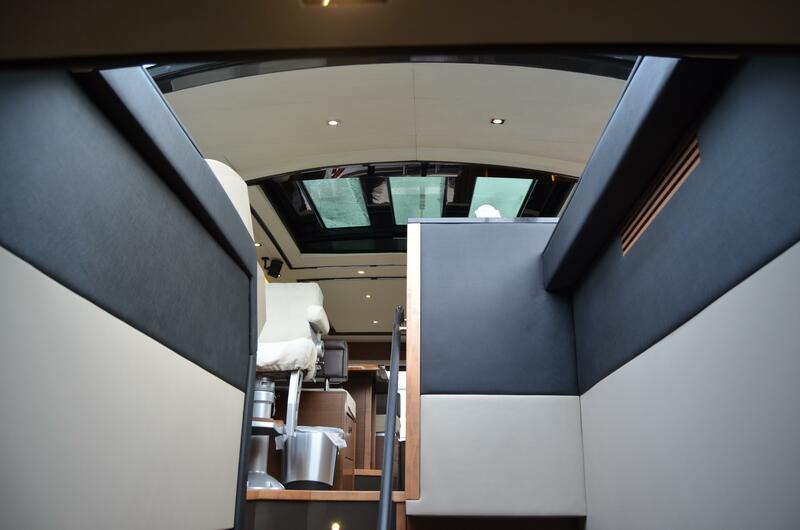 There’s a forward-facing seat and a double sunpad that can be adjusted. 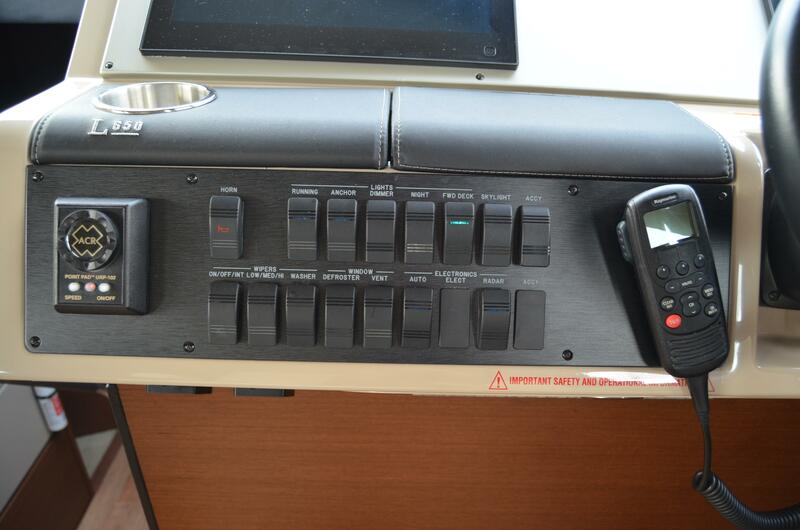 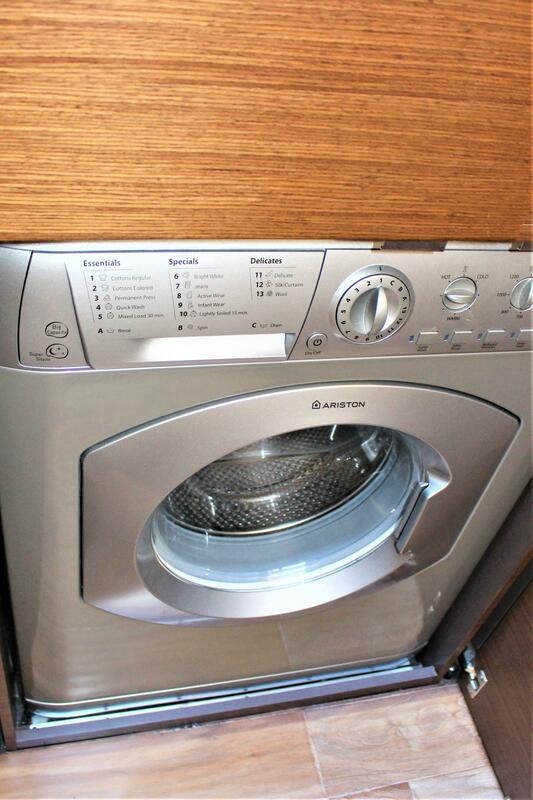 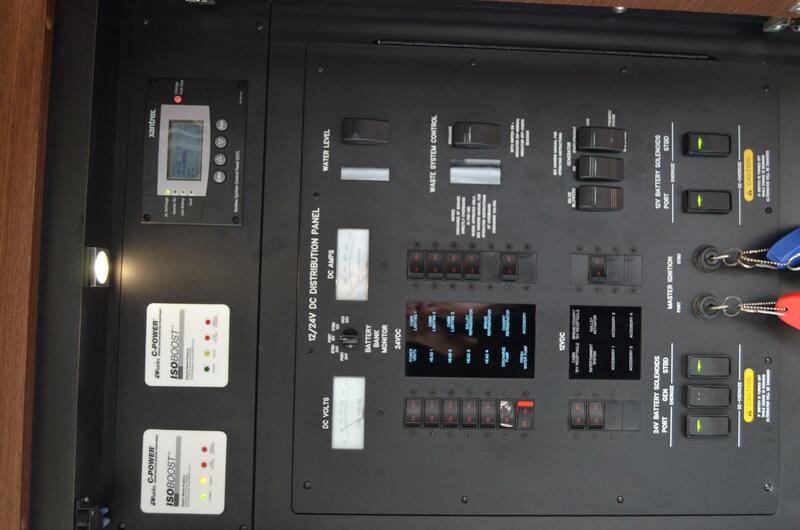 There are built-in speakers and a sound control panel. 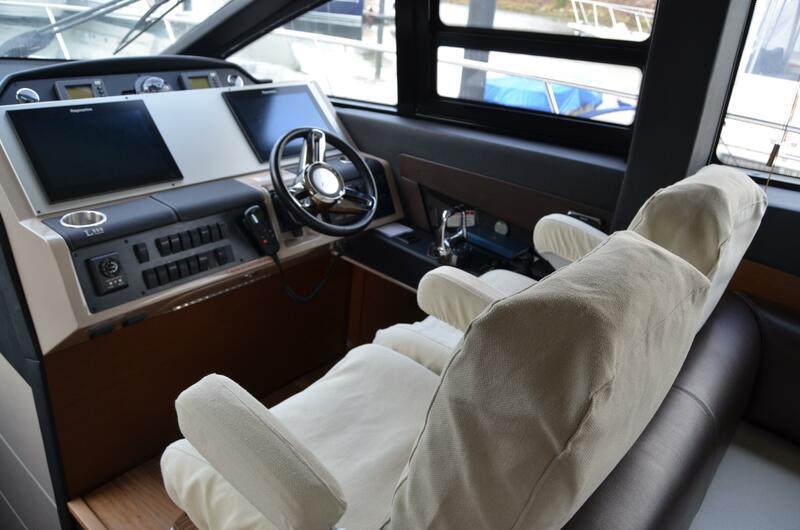 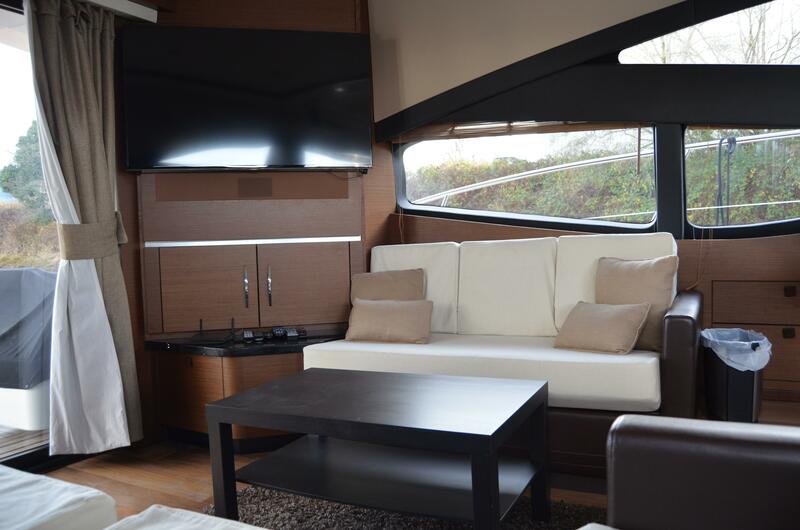 The interior is stunning with a blend of white Ultraleather seats and laminated walnut woodwork. 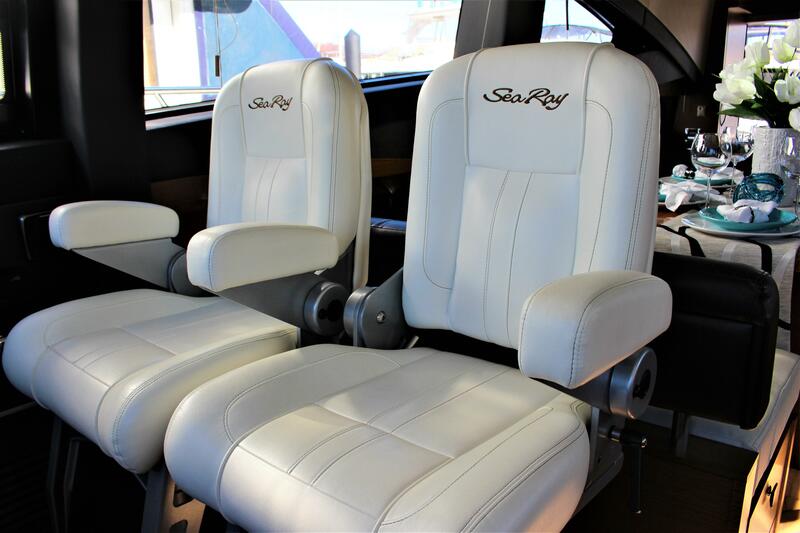 Custom made white seat covers are included. 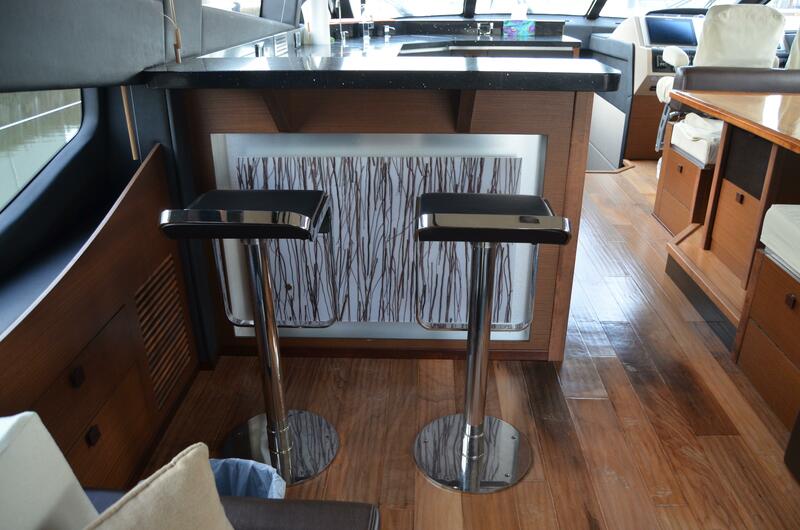 Flooring in the salon is wide-plank distressed walnut. 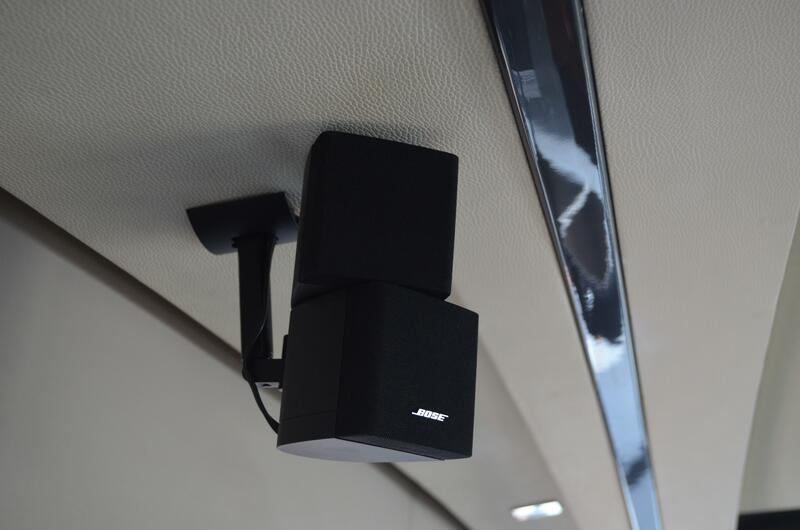 receiver, Apple Harmony and Samsung Blu-Ray player. 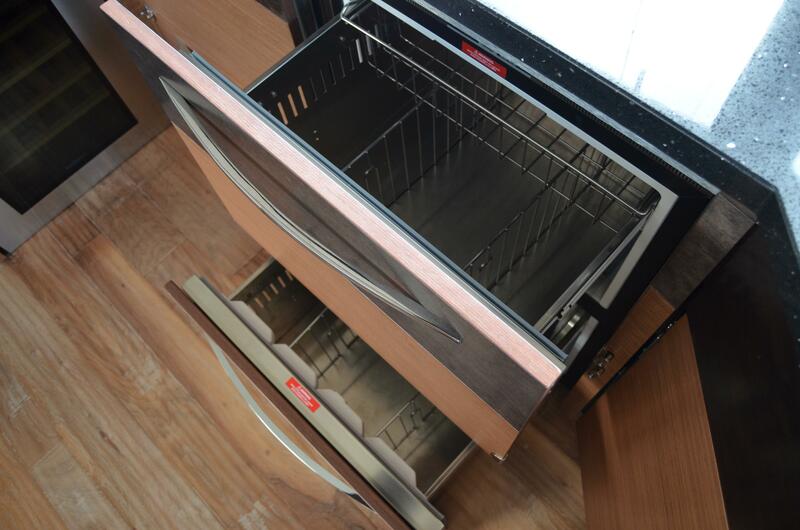 The galley boasts a drawer-style refrigerator and freezer, an induction Kenyon 3-burner cooktop, a drawer-style dishwasher and a convection microwave oven. 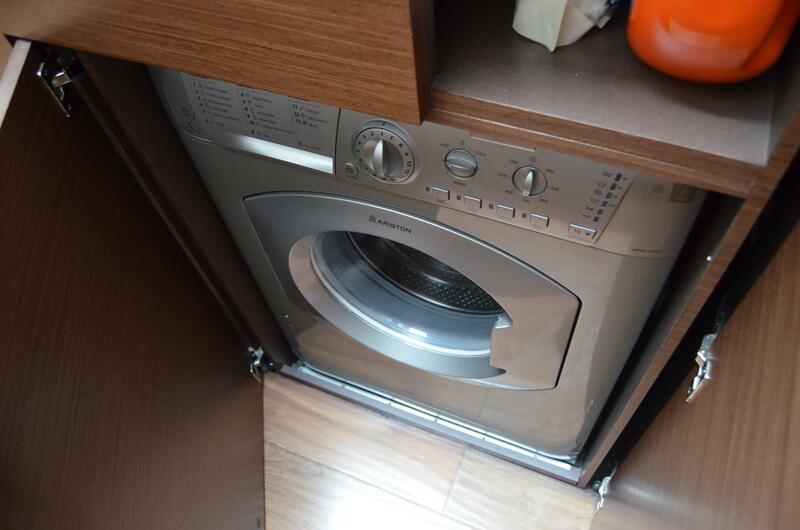 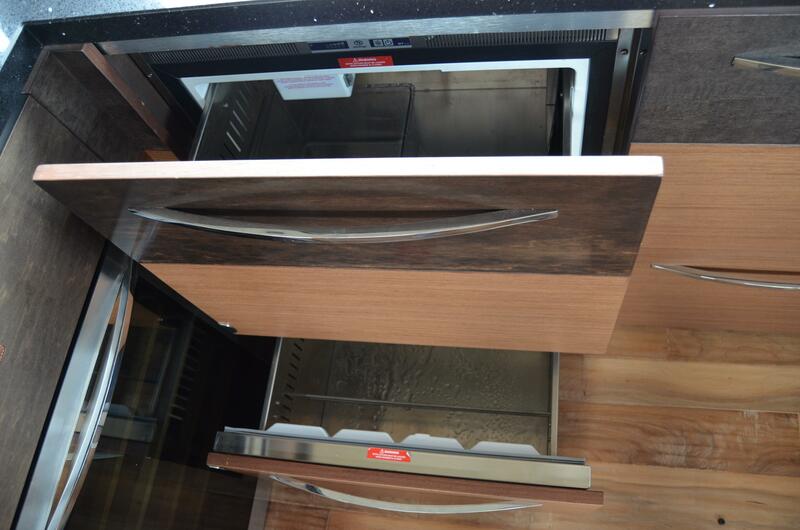 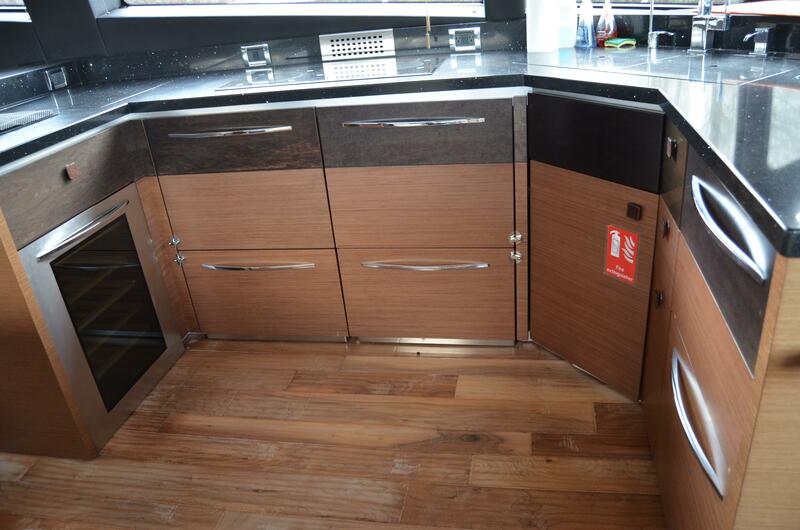 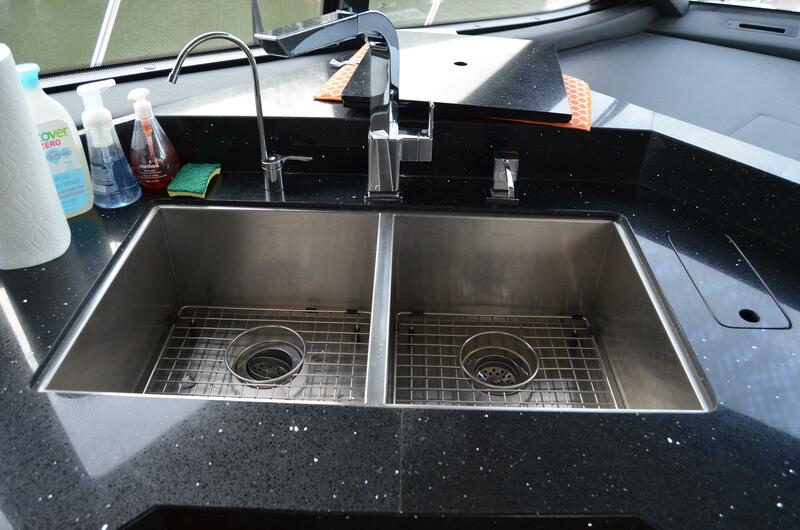 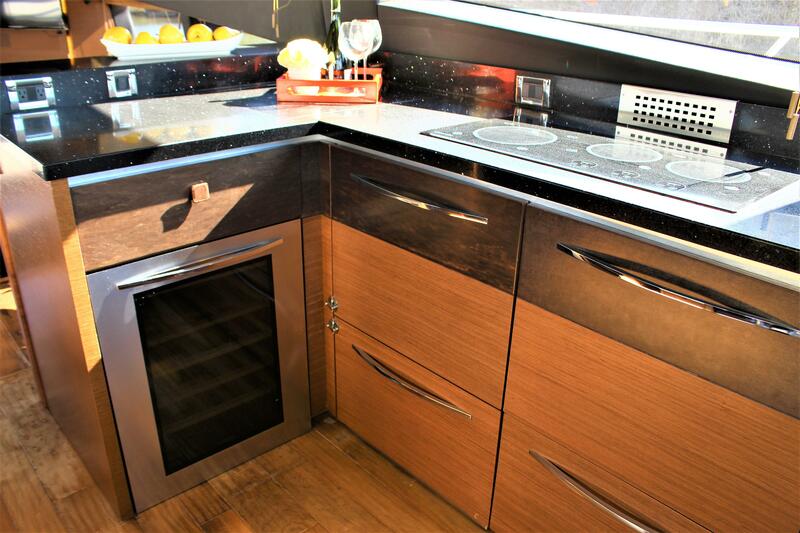 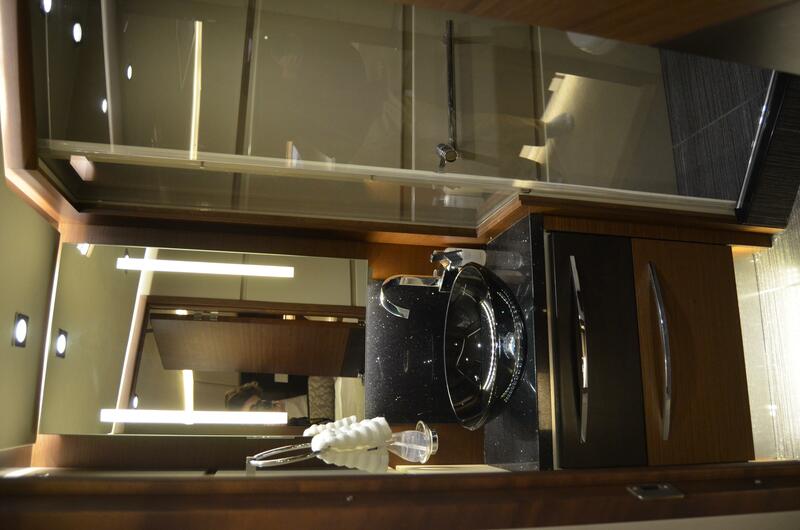 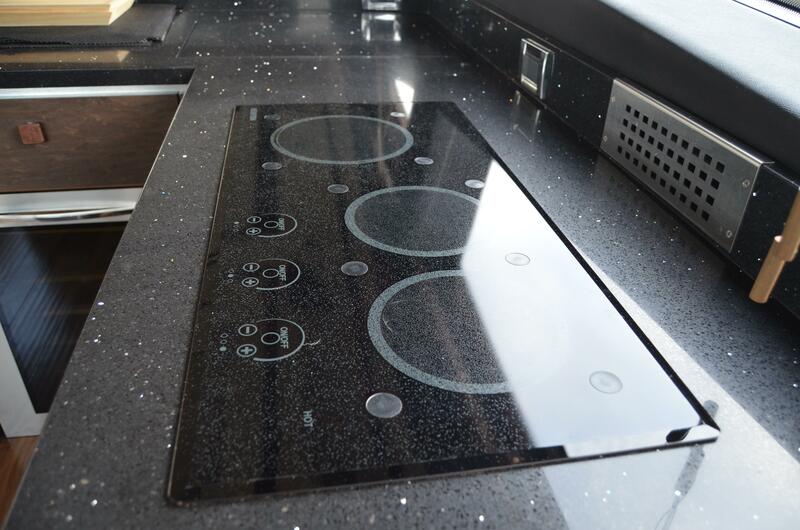 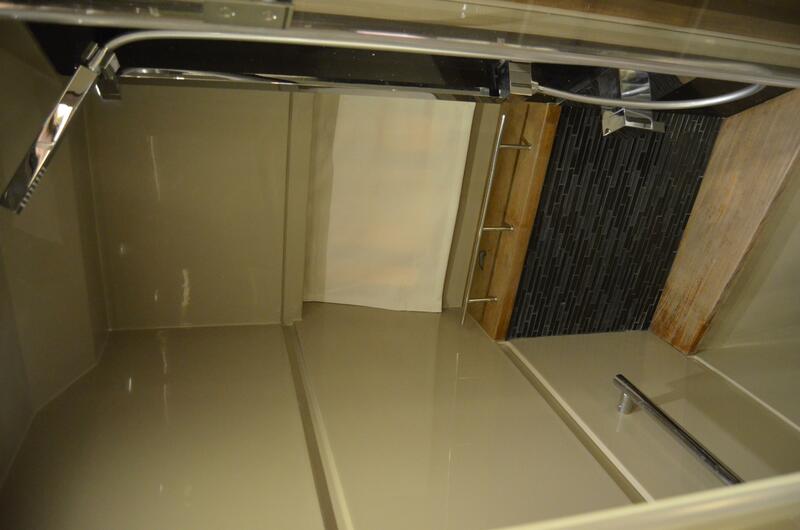 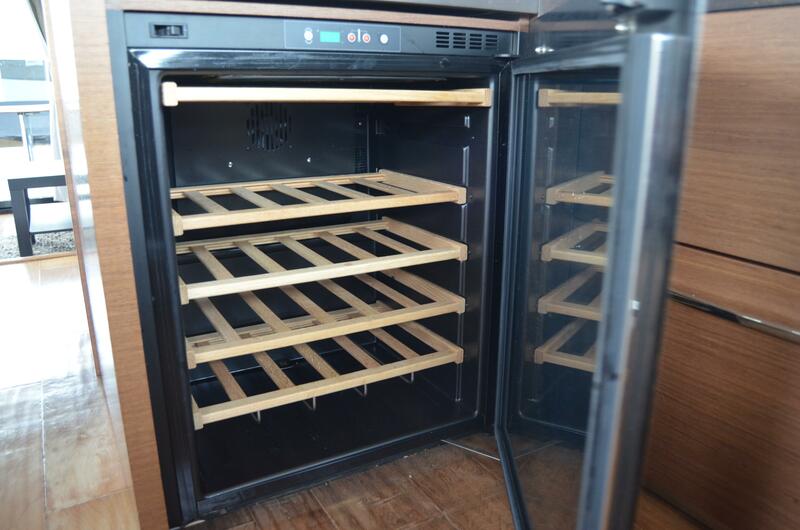 Also included are square stainless sinks, Isotherm wine fridge and lots of cupboard storage. 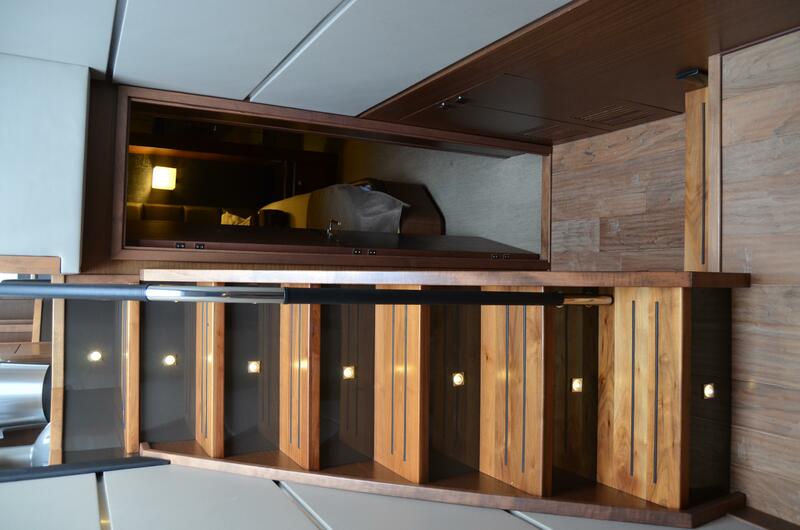 Four staterooms and three heads are accessed down a set of centerline steps, forward in the deckhouse. 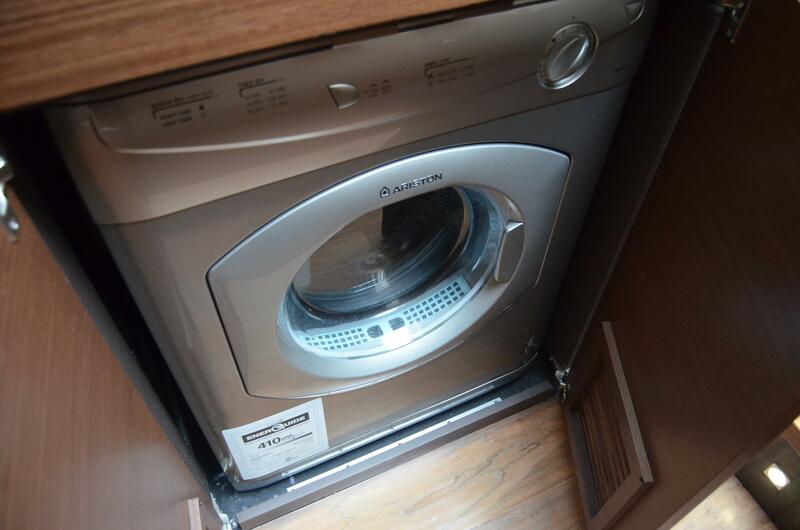 A washer and dryer are tucked neatly under the steps. 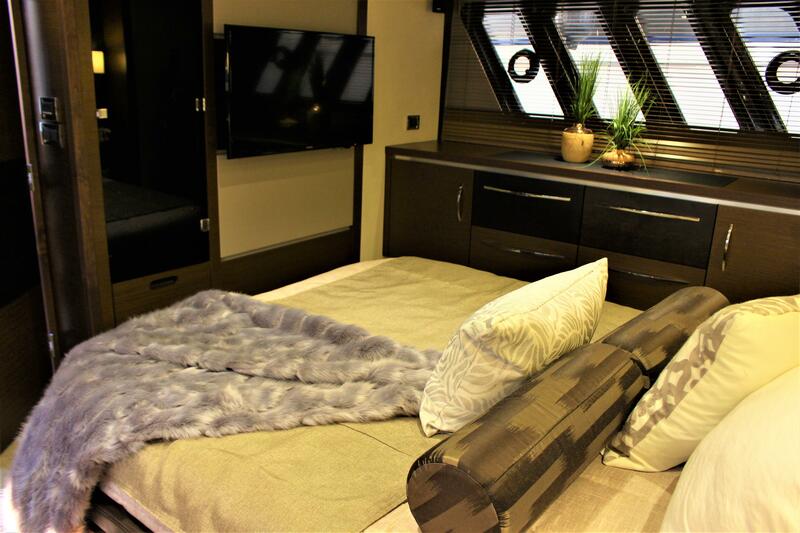 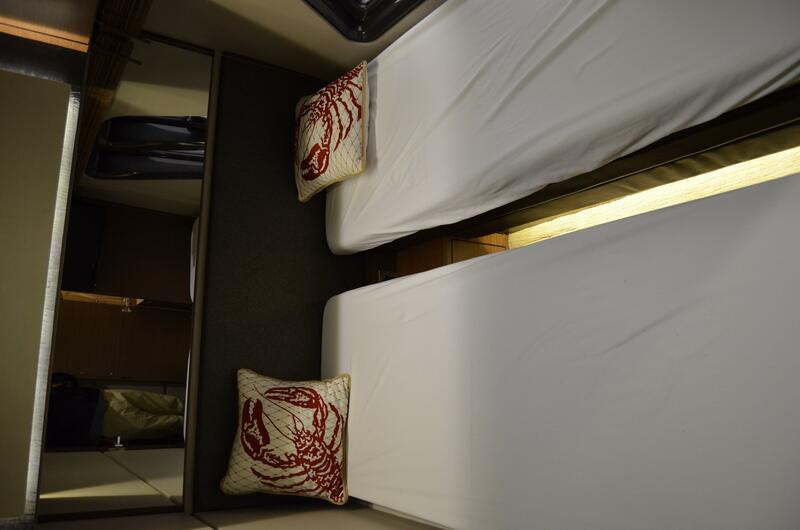 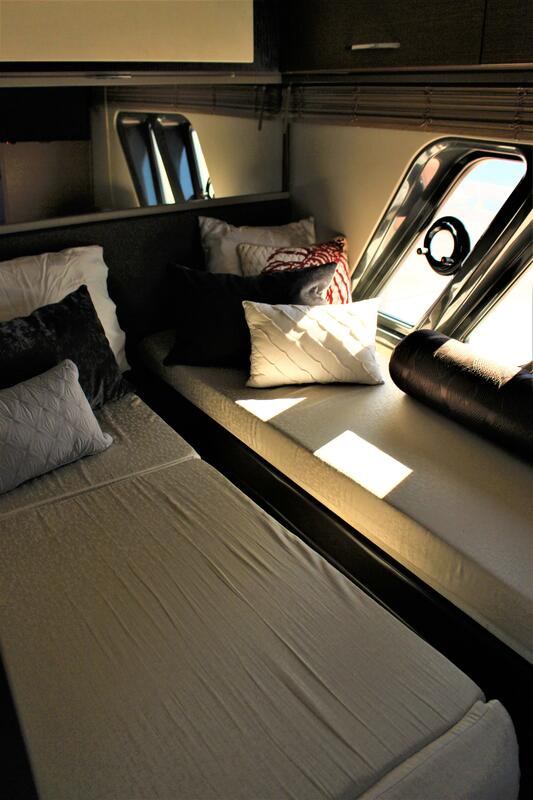 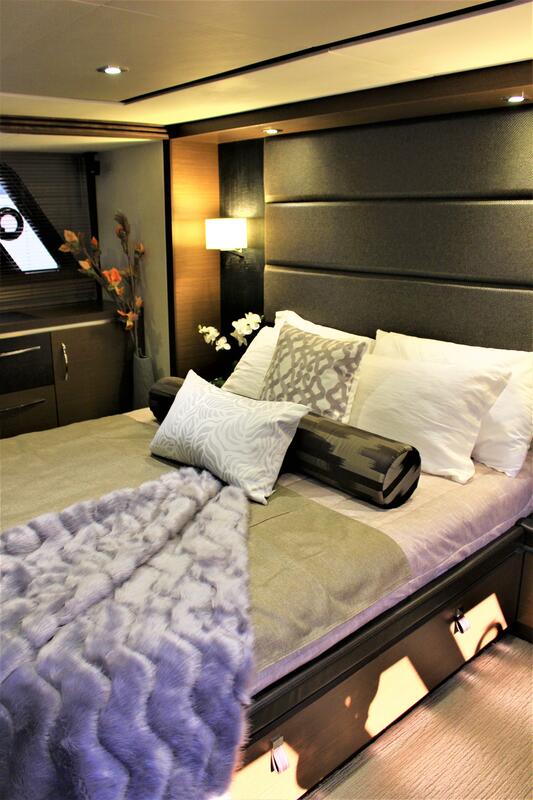 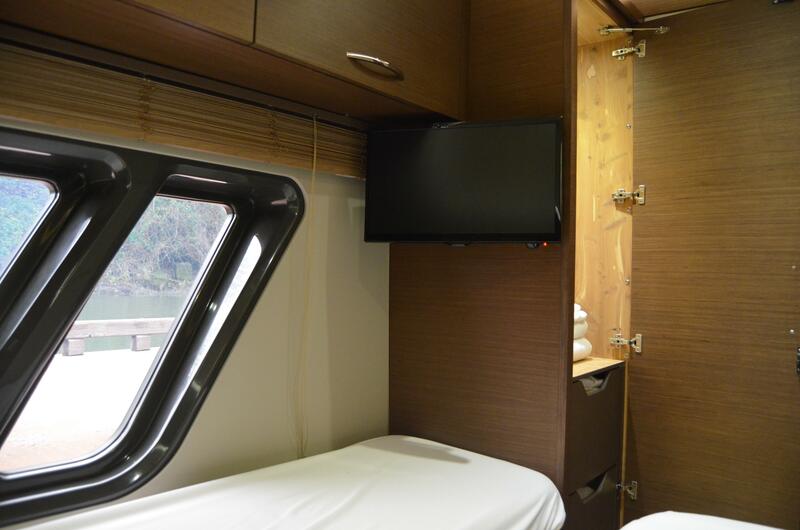 The two smaller staterooms each have comfortable twin beds, with a pad that can be used to convert to a master bed. 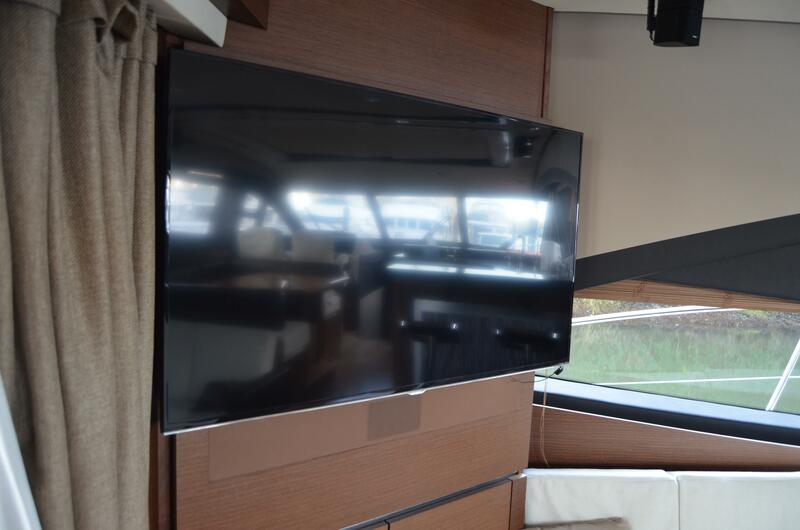 Includes flatscreen Samsung TV with Harmon/Kardon AVR 2700 receiver/amplifier, Direct TV receiver, and Samsung Blu-Ray player. 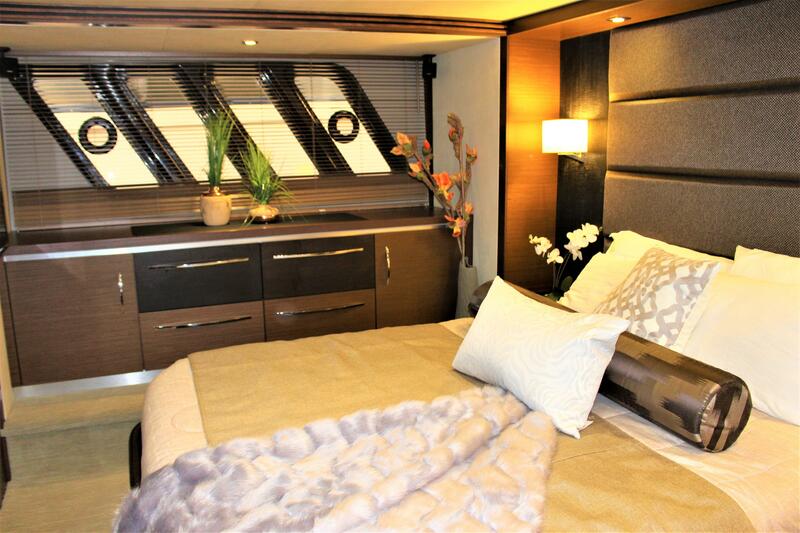 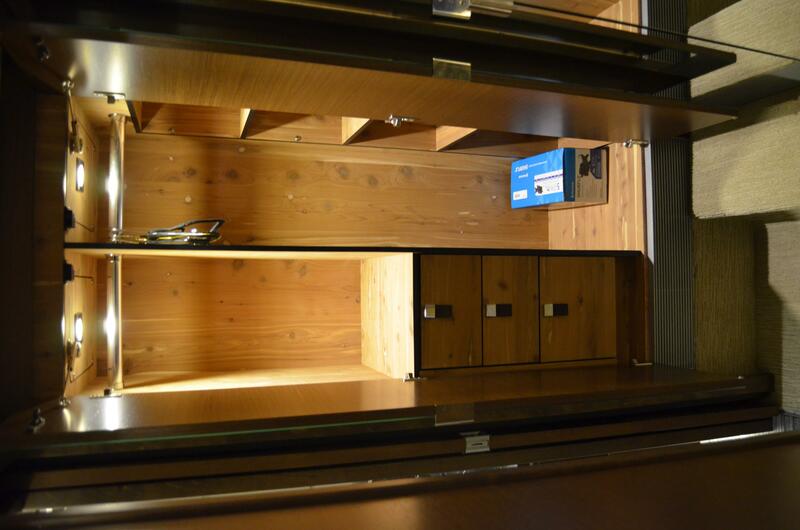 The VIP stateroom, is fitted with an island queen bed and plenty of drawer and locker storage. 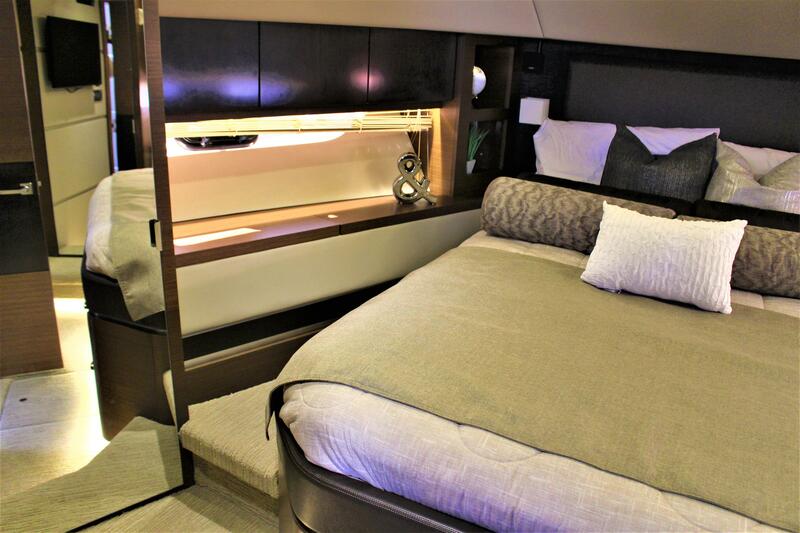 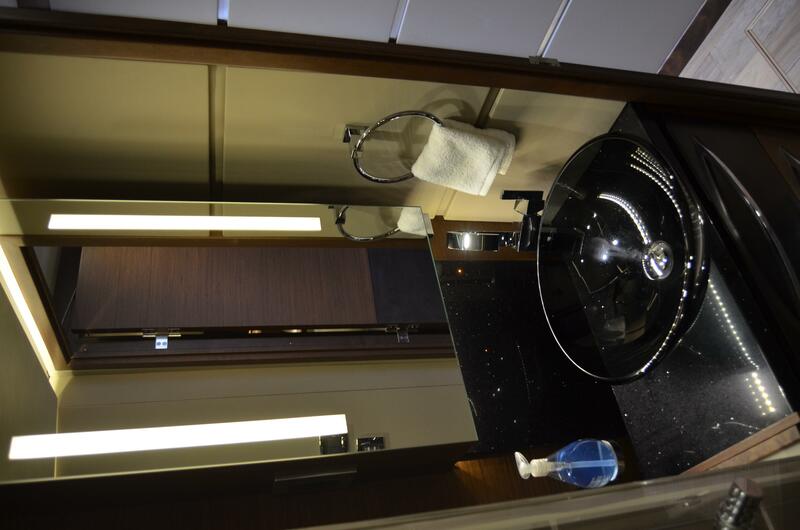 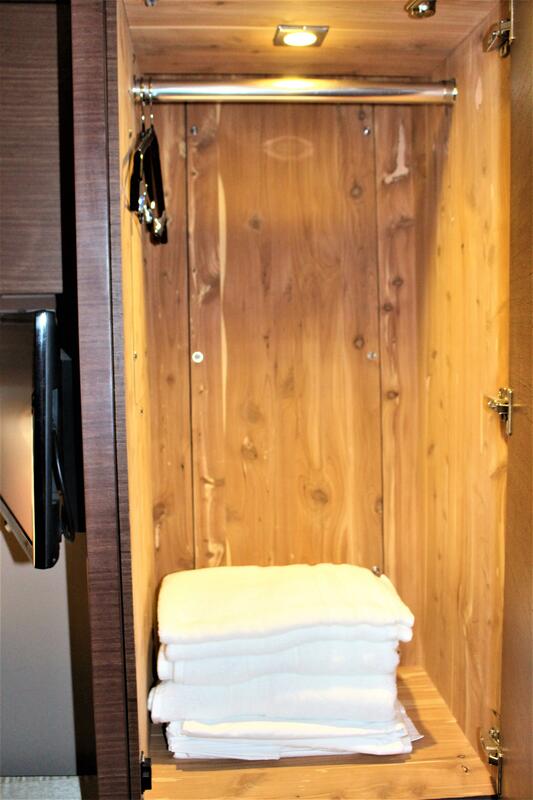 There are two heads, equal in size, with one being dedicated to the VIP stateroom and one for the two other staterooms, both with separate shower compartments. 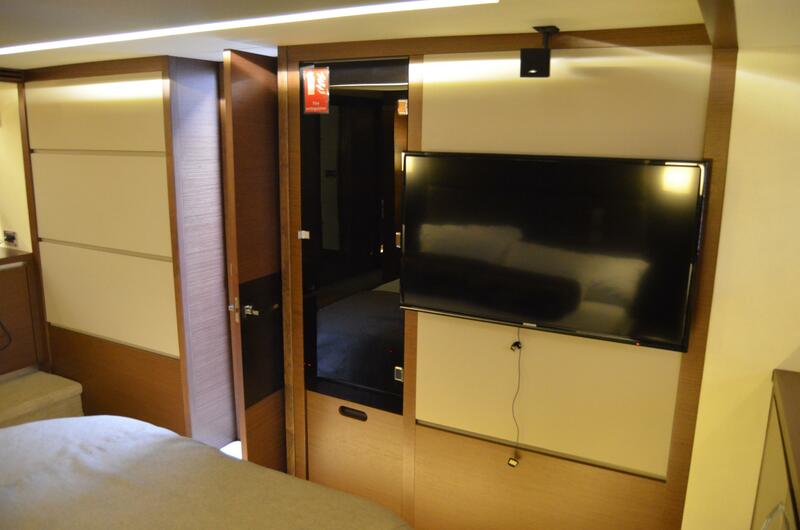 In each stateroom there is a flatscreen Samsung TV with Harmon/Kardon AVR 2700 receiver/amplifier, Direct TV receiver, and Samsung Blu-Ray player. 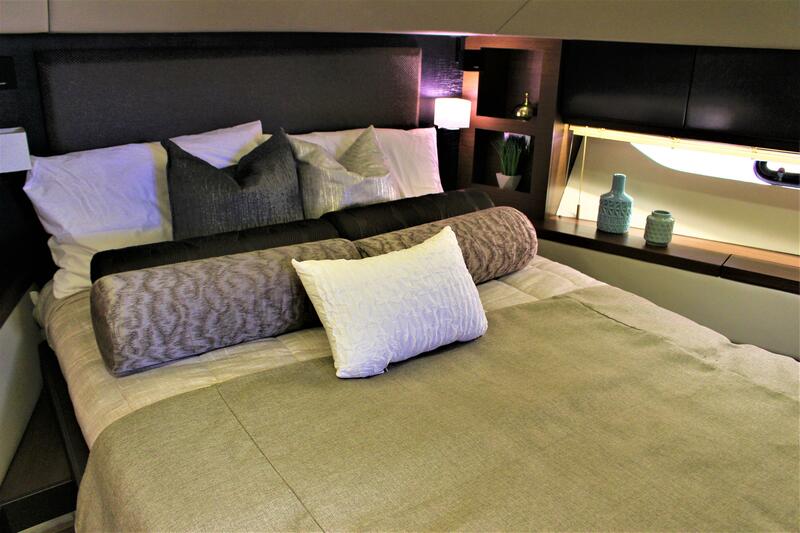 The master stateroom has plush carpet, fine walnut woodwork and plenty of open space. 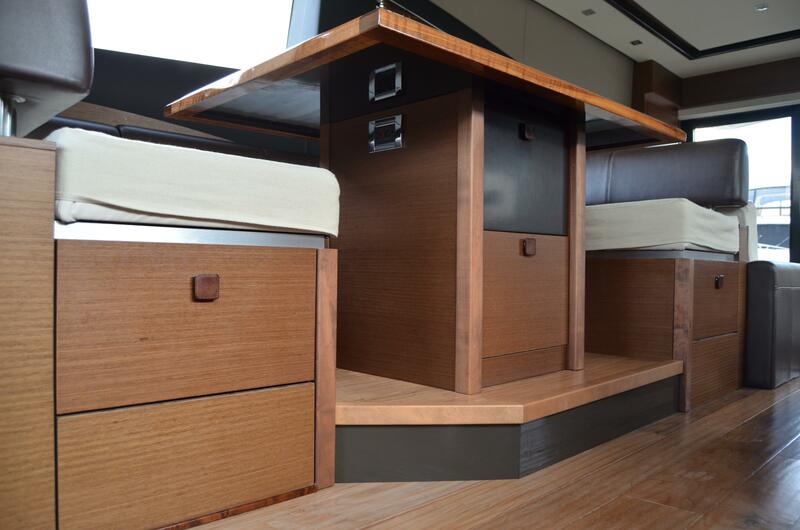 Dressing tables and plenty of drawers are situated along both sides of the space, allowing for plenty of storage. 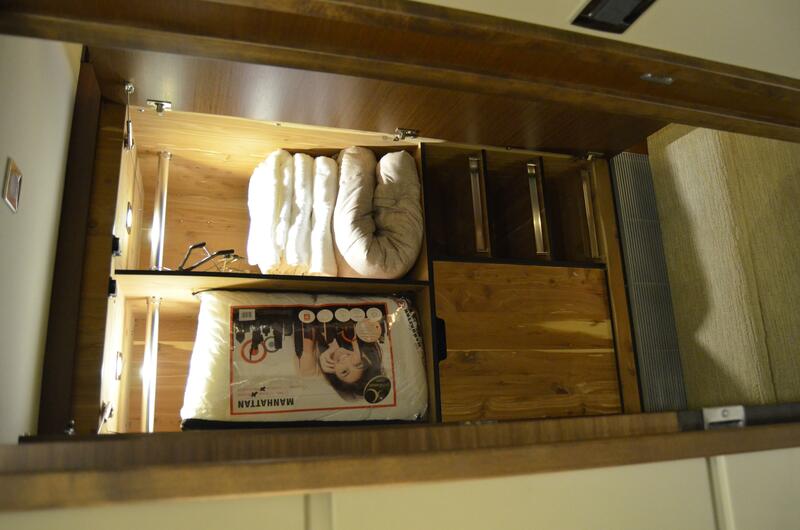 The queen-sized bed is very comfortable, and has plenty of storage under it. 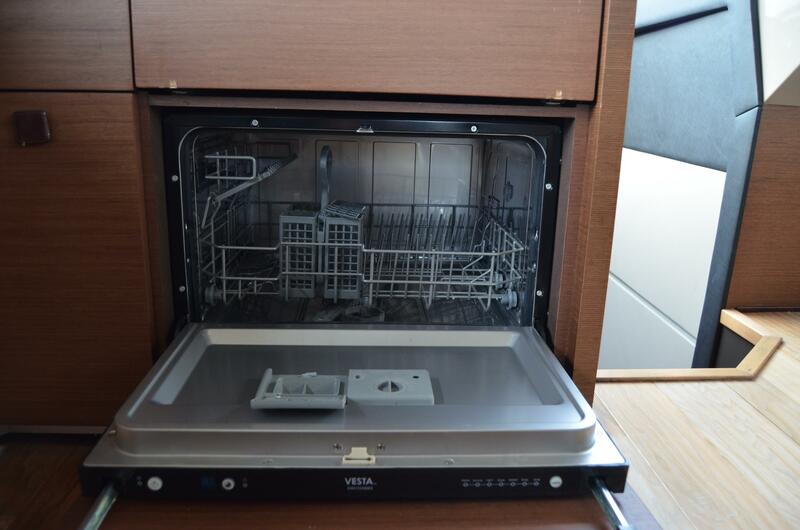 Entertainment includes a Samsung 45” flatscreen TV with Harmon/Kardon AVR 2700 receiver/amplifier, Direct TV receiver, and Samsung Blu-Ray player. 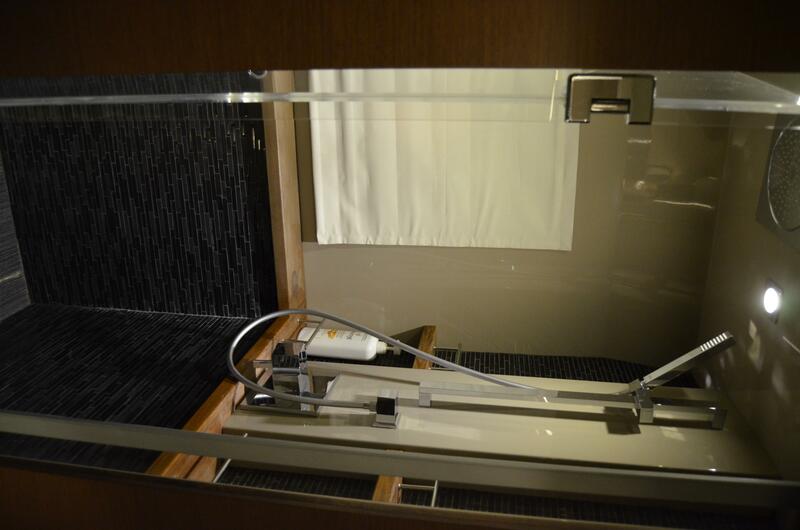 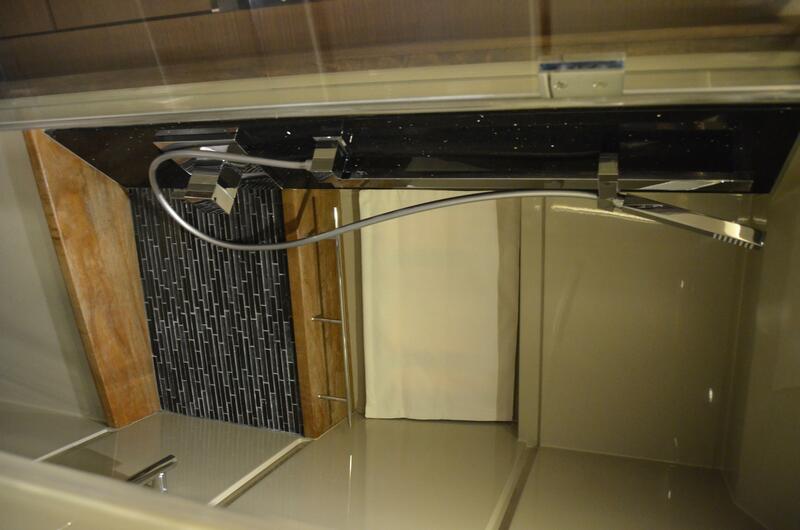 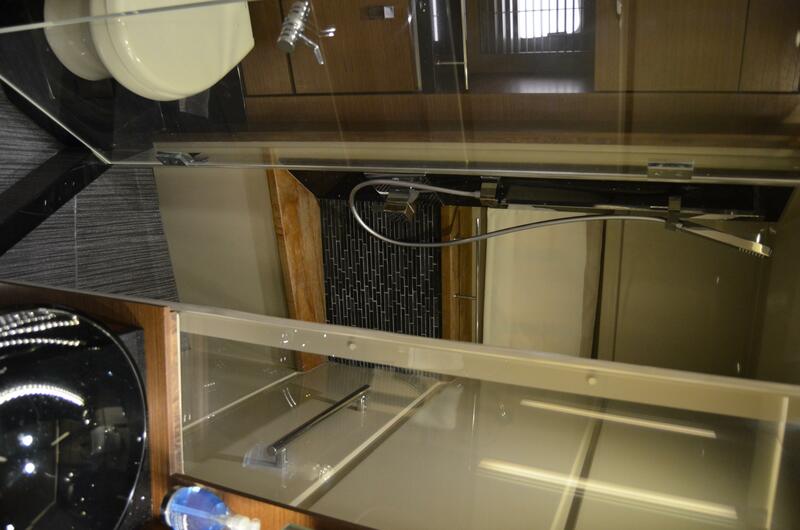 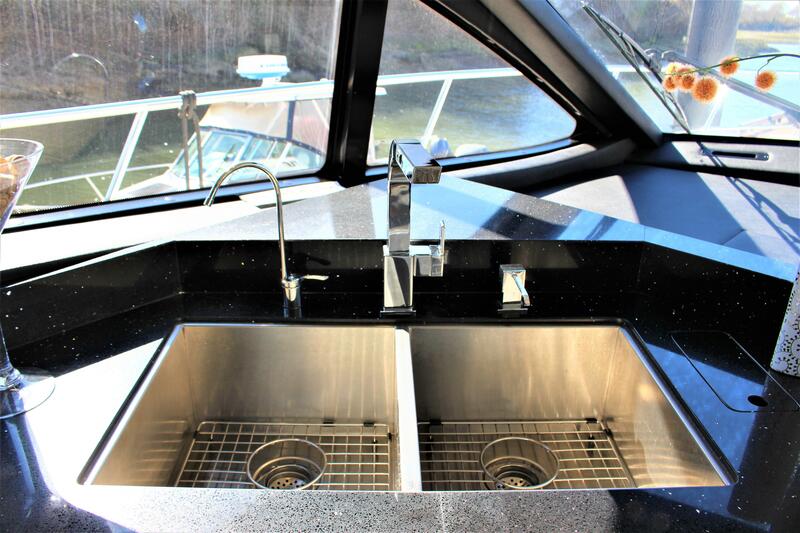 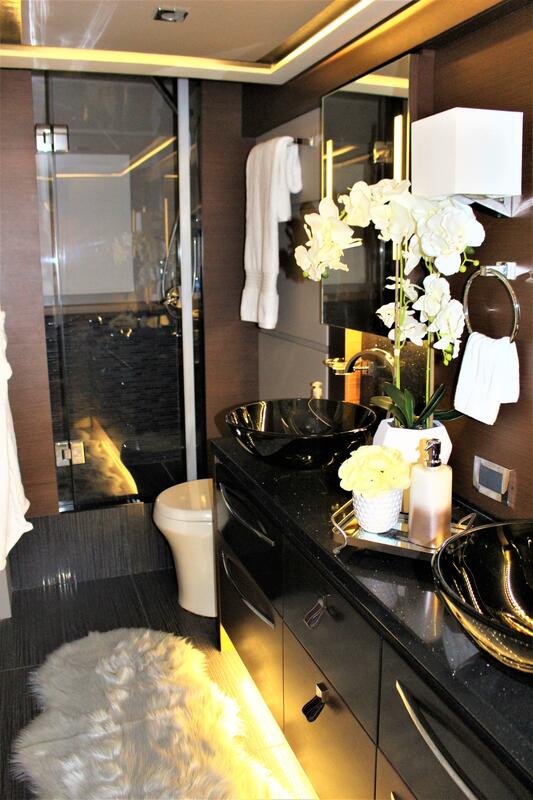 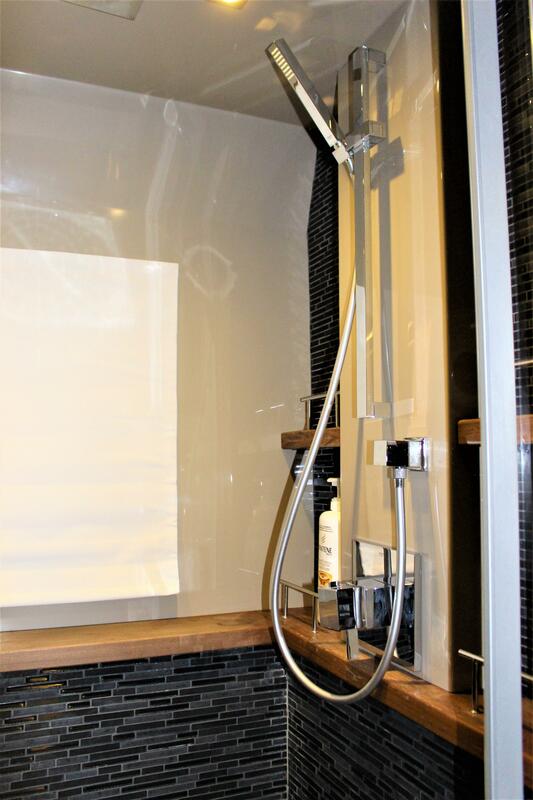 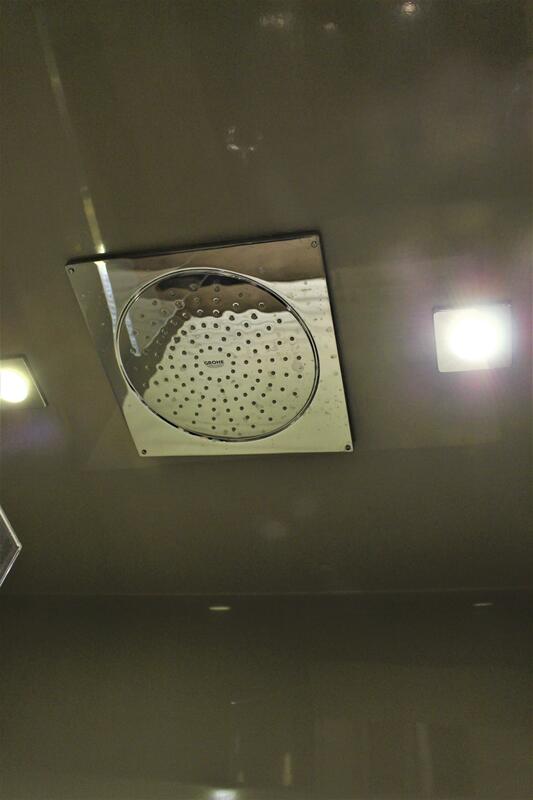 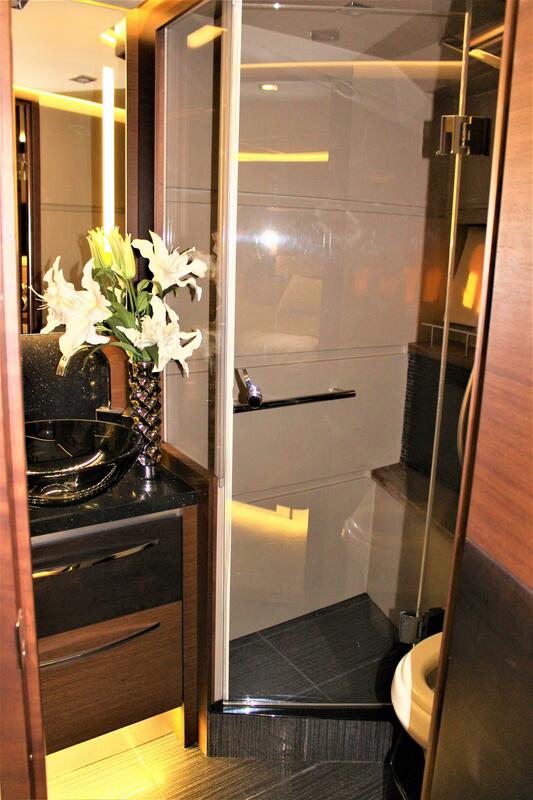 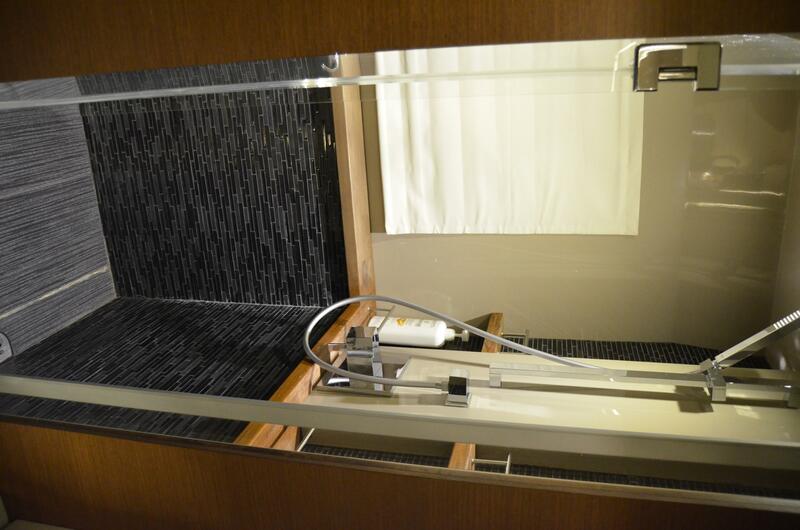 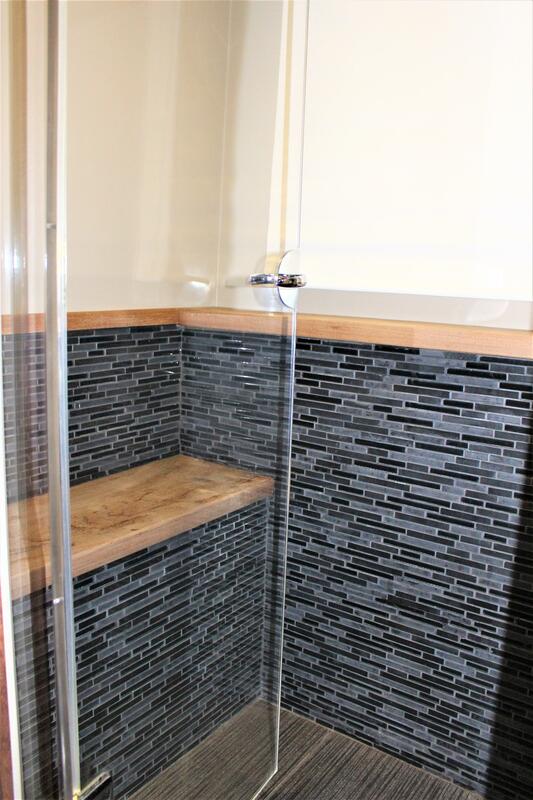 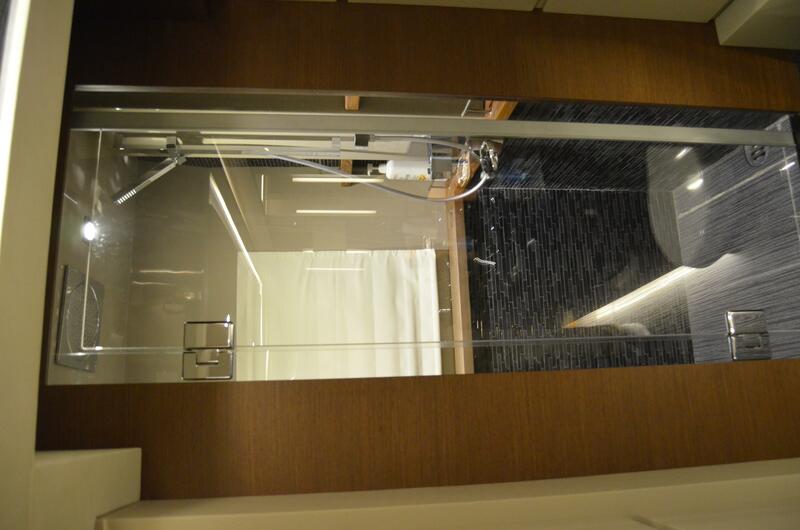 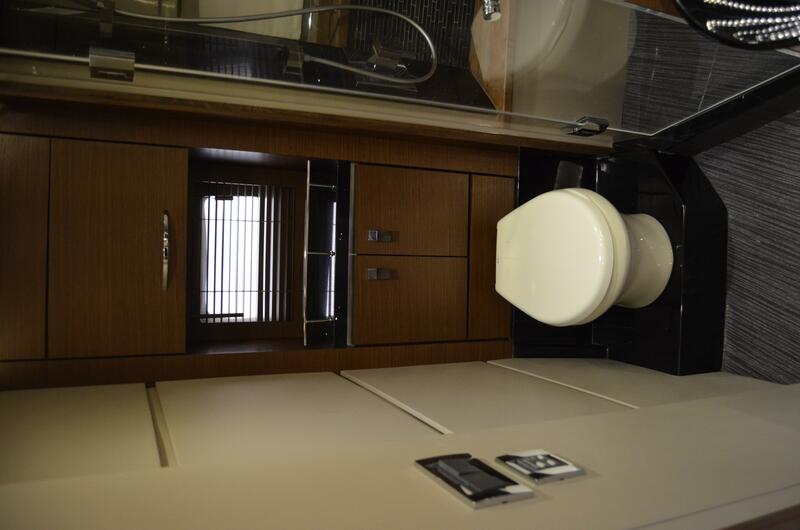 The aft section of the master is taken up by a full-width bathroom space, with an enlarged shower stall. 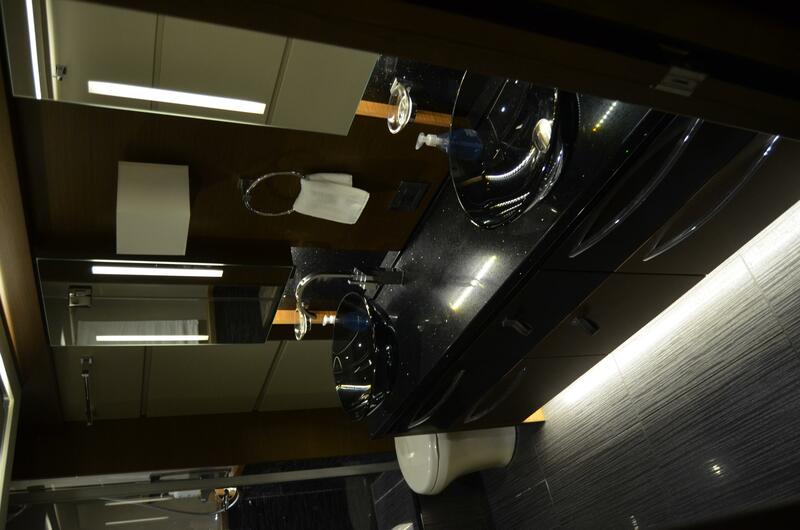 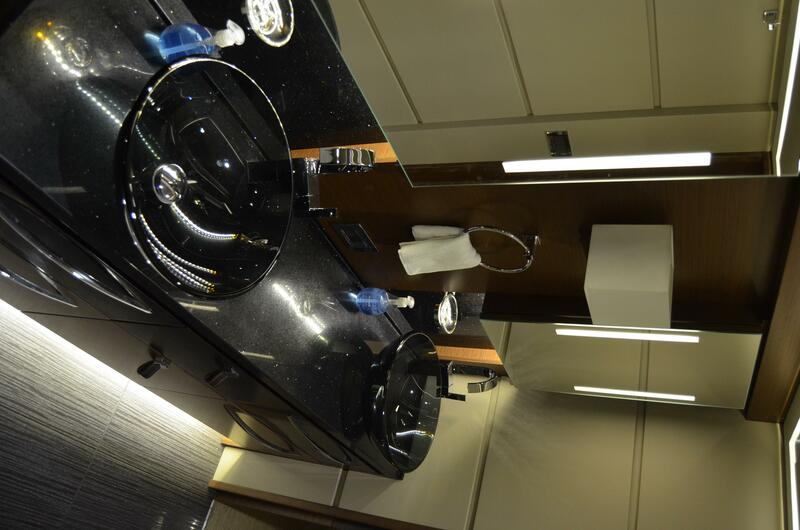 The black and gold-flecked counter has twin sinks. 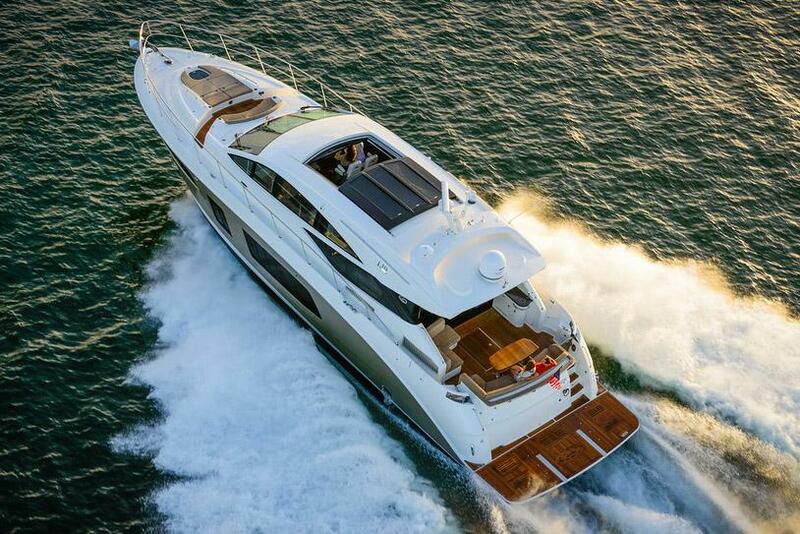 The L650 is a powerful, high-speed, solid performer with an intelligent array of luxury features. 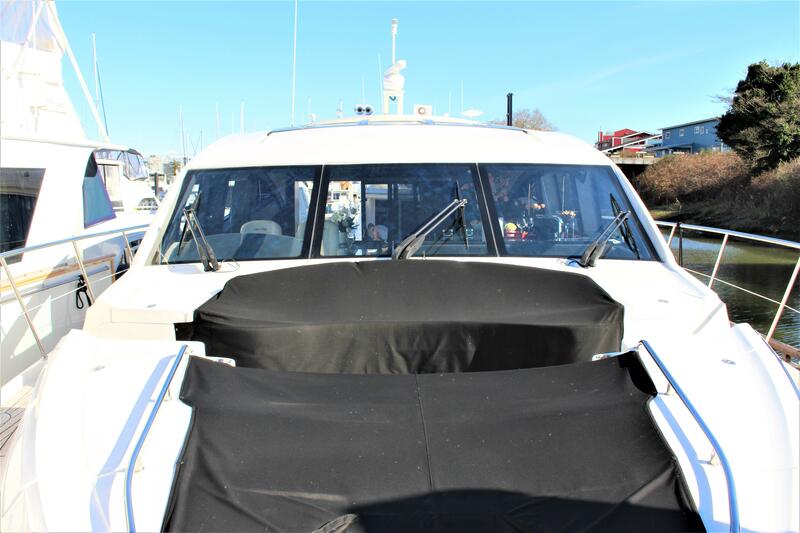 It would work well for an owner who wants an entertainment platform or is planning a long summer coastal cruise, perfect for our BC waters!